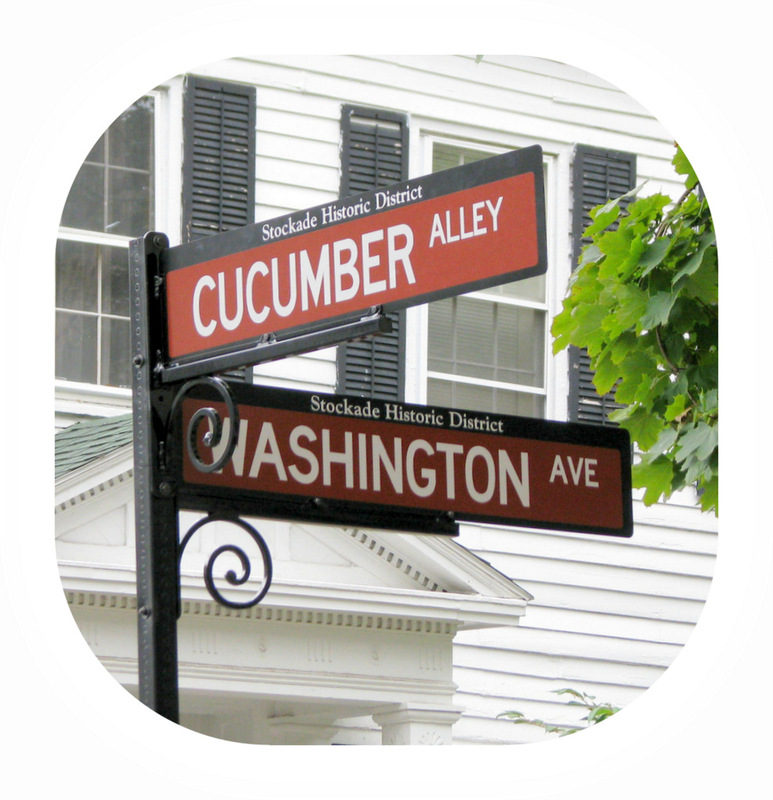 The name Cucumber Alley, like the wild cucumber vine for which it is named, has sprouted quite naturally on the little lane that leads from Washington Avenue in the Schenectady Stockade down to the Mohawk River and Binnekill creek. Like the plant, the unusual name has been seen as pesky and unwanted by some, while being treasured by most others for its humble charms. Thankfully, both name and plant have been almost impossible to banish. Although the alley is short and straight, the path to its current name is surprisingly long, bumpy and twisted. 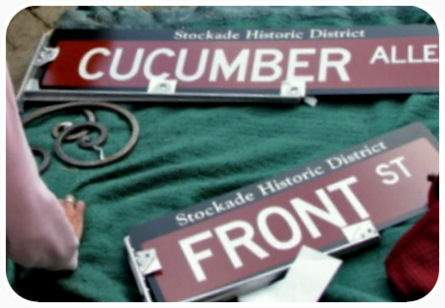 The outcome was never inevitable and the rules never clear, but history and the Stockade neighborhood have clearly won the Cucumber Alley Name Game (for now). 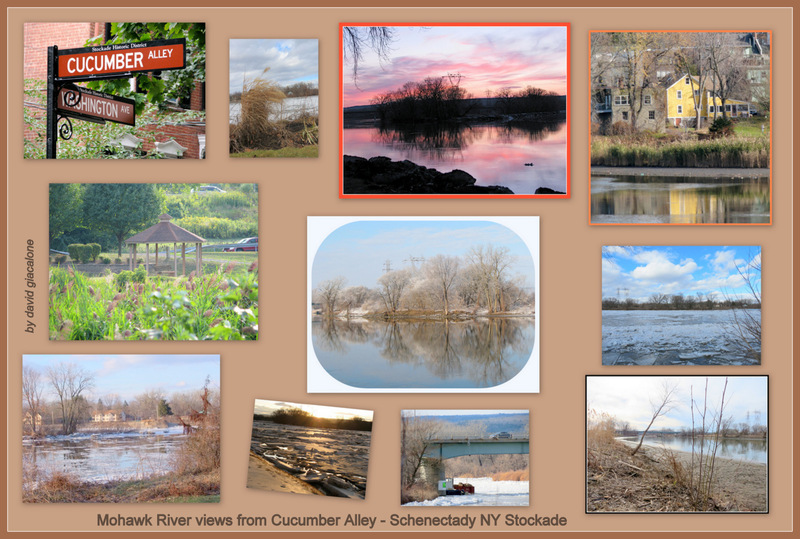 – click on this collage for views of the river end of Cucumber Alley . . 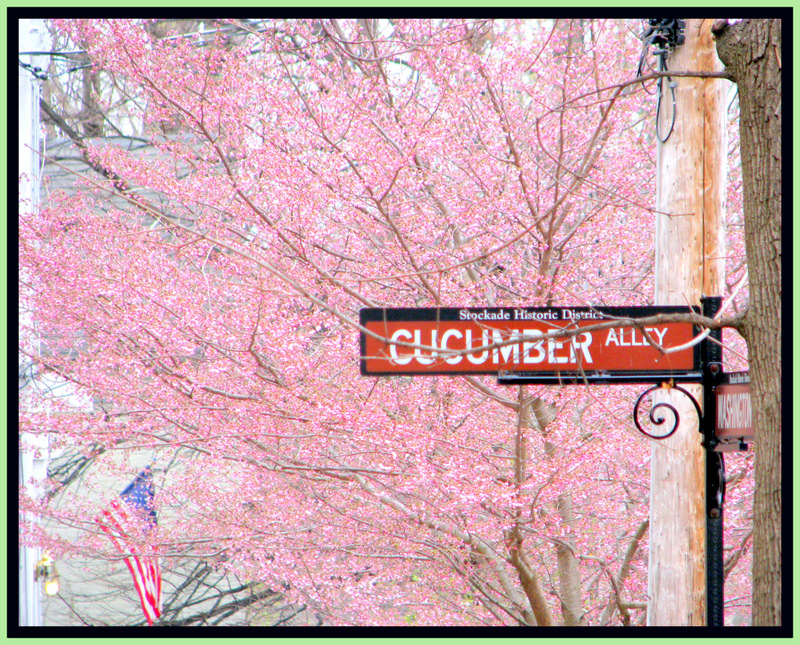 Location: [click for Google Map and street view] Cucumber Alley is located in Schenectady, NY, USA, in the City’s Stockade Historic District, starting at the corner of Washington Avenue across from its intersection with Front Street, and running about 300 feet westward to the Mohawk River. Its geographical coordinates are: 42.8177665 and -73.9490356. See our companion posting “celebrating Cucumber Alley” for over 100 photos (including more than a dozen loosely-themed collages) taken of and from Cucumber Alley.
. . . One of my favorite things about Cucumber Alley is its name. 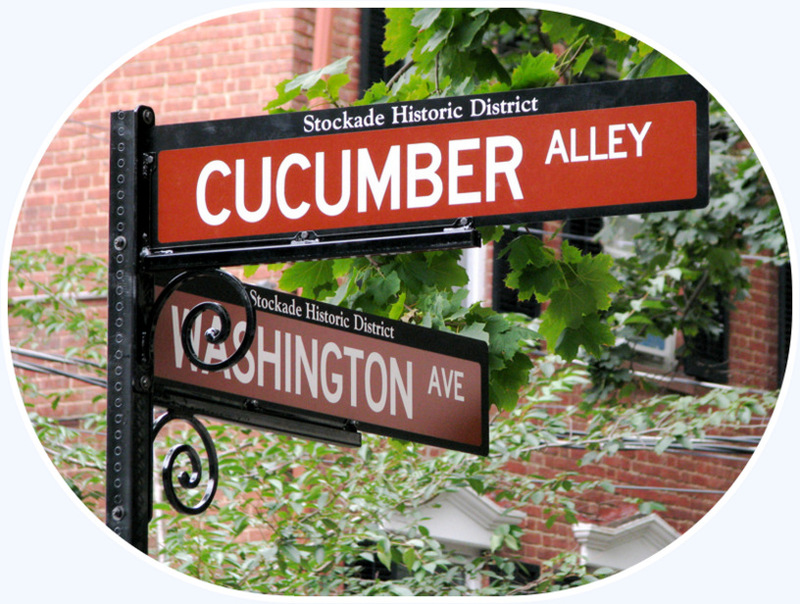 The lane is called “Cucumber Alley,” because of the wild cucumbers (scientific name: Echinocystis lobata), that have long been found along the river bank at the end of the alley. (The USDA sketch of the plant is shown at the head of this paragraph, as is a photograph by Brian Johnston in Micscape Magazine.). 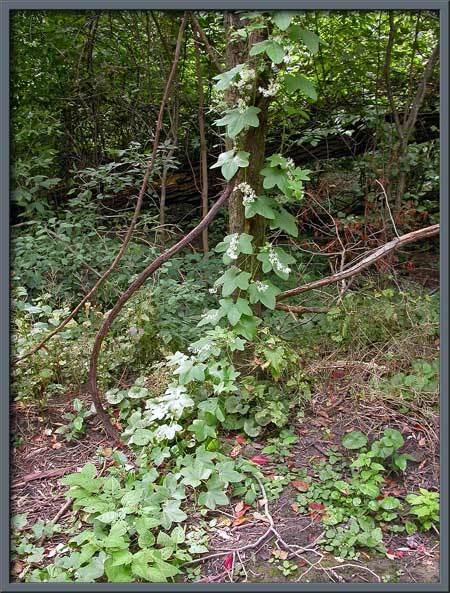 According to “Wild Cucumber and Bur Cucumber“, by Beth R. Jarvis for the University of Minnesota Extension, the wild cucumber weed is often found along river bottoms, swamps and other low areas, and has smooth, branching vines that can reach lengths of 15-25 feet, and which can “climb and almost engulf trees.” When ripe, the wild cucumber’s 2-inch-long, spine-covered, oval, pulpy seed pods burst open and eject four seeds. “The name, of course, comes from the wild cucumbers that used to grow along there. 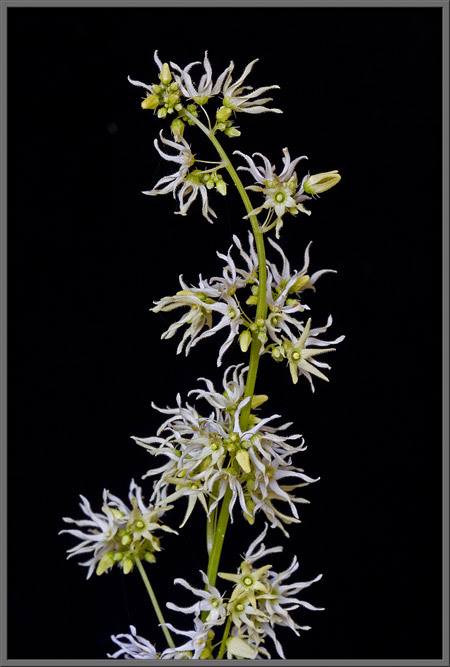 They were cucumbers gone wild–or rather, never tamed–and that’s all there is to it. . . .
To better understand why the blossoms might have been a most welcome sight, see “A Close-up View of the ‘Wild Cucumber’” by Canadian Brian Johnston, in Microscopy-UK‘s Midscape Magazine (October 2006), which is a striking and instructive article about the wild cucumber, with an array of beautiful photographs. In case you are wondering about the plant’s formal name, Johnston notes that: The genus name Echinocystis is derived from the Greek words echinos, meaning “hedgehog” and kustis meaning “bladder”. These terms refer to the shape of the fruit. 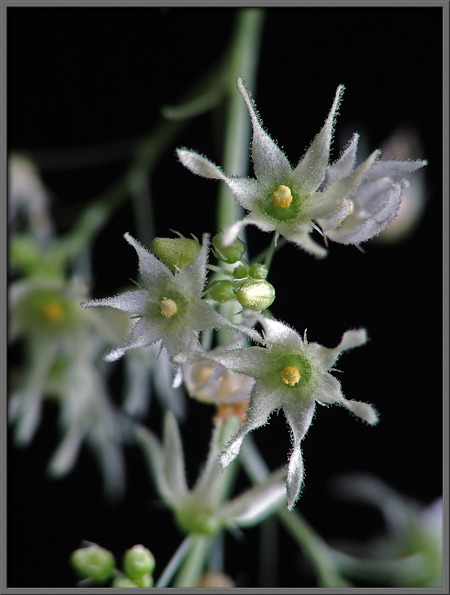 It is in the order lobata because of its tentacles and lobes. 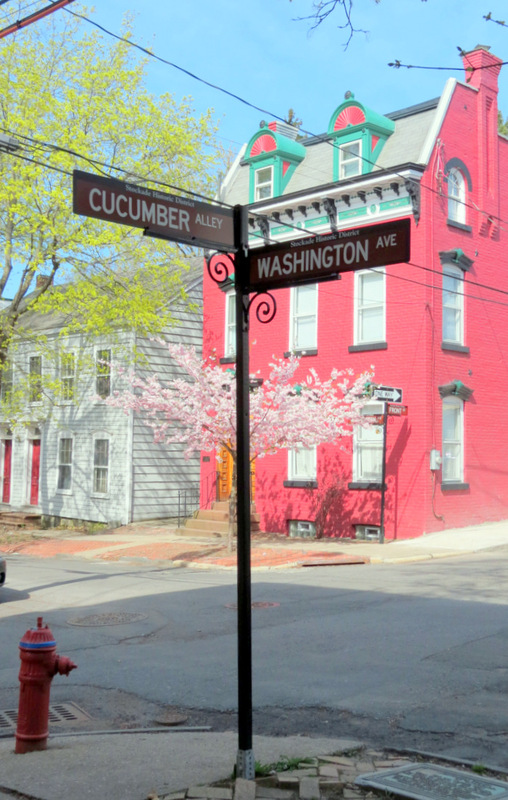 Some wags have suggested that the plant might have also been popular on Cucumber Alley at the Van Slyck Inn, Schenectady’s first tavern, due to the purported hallucinogenic properties of wild cucumbers. That might be a topic to explore further in a Walkabout reenactment, Stockade Association Meet-n-Greet at the Van Dyck, or Historic Society seminar. 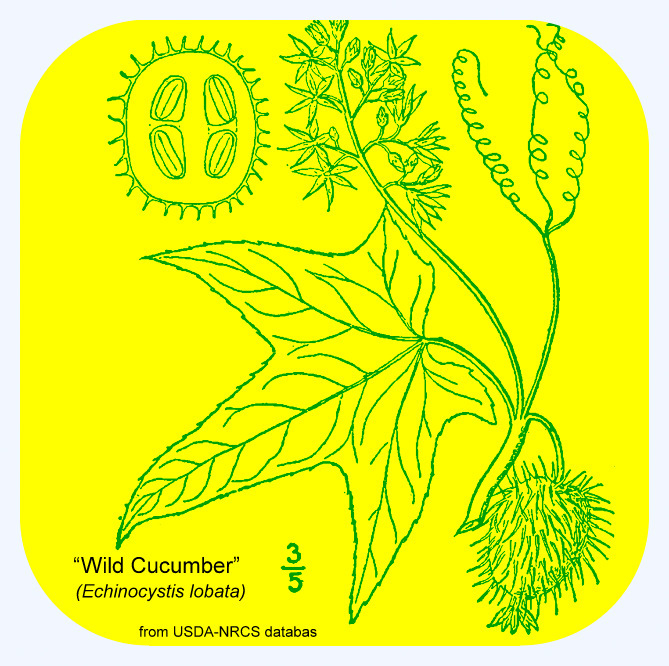 Incidentally, speaking of chemically-induced states, a plant that is sometimes called “wild cucumber” or “manroot” is found in California, and has been confused at times with the plant that grows at Cucumber Alley, but is a different species [Marah macrocarpus]. To make fish easier to catch, some native American clans mixed a substance made from that plant’s tubers into ponds to stun the fish with a poison named saponin. (learn more here and there.) 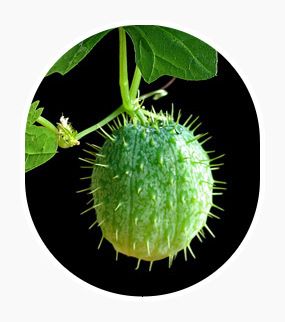 That trick probably would not work in a flowing river or creek, even if the California wild cucumber did grow here. Rarity: The street name Cucumber Alley is quite rare: My internet search has located only two other thoroughfares with the name Cucumber Alley: One a covered lane in London’s Covert Garden, Borough of Camden, which was once the site of the City’s largest fruit and vegetable market [see its street sign, a Bing Map, and a view of its row of shops]; and the other a rather uninspiring little road in Florence, South Carolina (Google satellite map). But, the phrase “Cucumber Alley” is rather catchy, and there’s a race horse in Britain with that name; and a coral reef diving site off of Australia that is called Cucumber Alley, due to the sea cucumbers that live there. Award-winning local indie film-maker Michael J. Feurstein calls his studio Cucumber Alley Lighting. And, there’s also a color palette called Cucumber Alley (for no reason discernible to my eye). 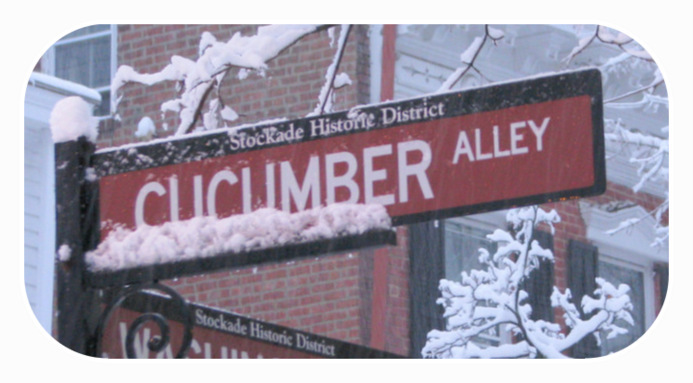 Discord: Although seeing or saying the words “Cucumber Alley” often makes me smile (and, I frequently hear people outside my window being pleasantly surprised by the name on its street sign), it has apparently been considered an inappropriate or undignified appellation by certain stodgy, snobby or, as we shall see, greedy Schenectadians. 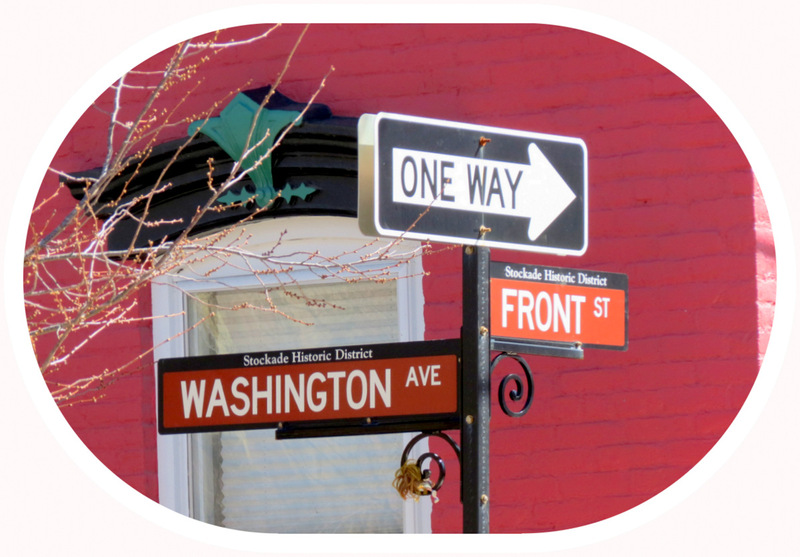 For two centuries, there has been a struggle between those wanting to call the little roadway “Front Lane”, “West Front Street”, “Front St. continued”, or “Front Street Extended”, and those who cherish the name Cucumber Alley and its history. 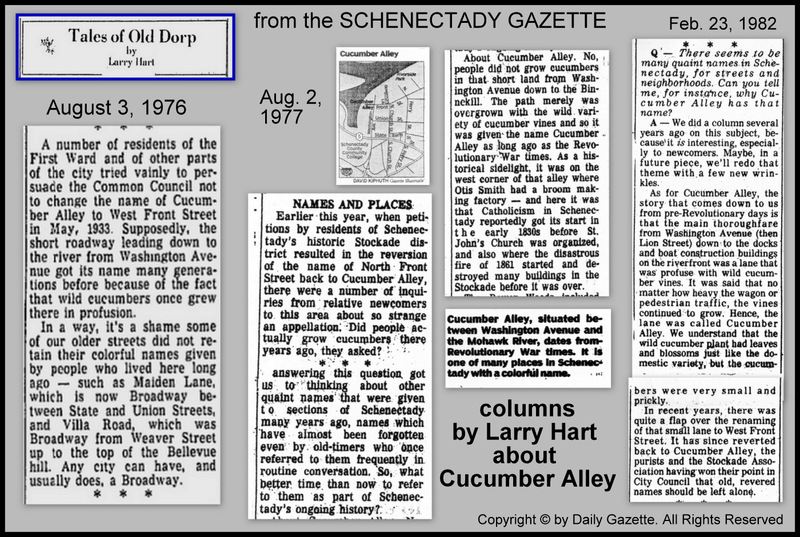 No matter its “official” name, however, it has been called Cucumber Alley in the common parlance since the 18th Century, despite the fact that it apparently was never officially designated by the City as “Cucumber Alley” until 1977. Alley? The word “alley” has a negative connotation or at least a diminished status for some people it seems, making it unseemly to them as a proper street address. That is because an alley is thought of as merely a narrow street or passageway between or behind city buildings, which is often used for access to a servants’ or service entrance or for placement of refuse, carriages, or stables. 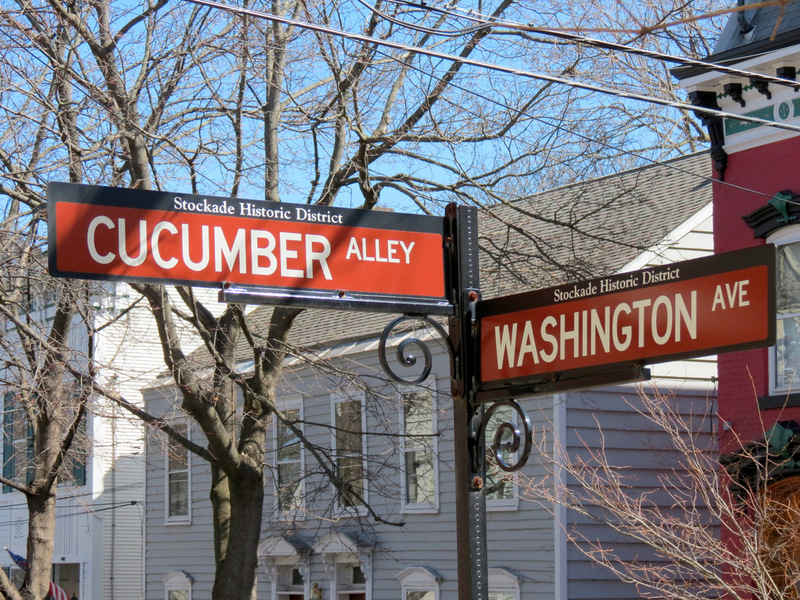 If the categorization as an alley were the primary complaint of the opponents of the name Cucumber Alley, calling it a road, lane, mews, place or street should have solved the problem for the naysayers, while keeping the historic cucumber connection. But, they do not seem to have proposed that alternative. Well, I object, Your Honor. It’s difficult to understand how notions of euphony — being pleasing to the ear — could have been so different a century ago that the prosaic “Front Street continued” was deemed a more pleasant sound than “Cucumber Alley.” The distaste must instead have been related to some assumed genteel notion of propriety rather than a purely auditory sensation. As seen below, such bias against the name resulted in it being changed in 1933, at the request of a number of Dr. Yates’ Washington Avenue neighbors. Notice by John McEncror, Jr.
All persons are hereby forbid throwing or dumping any dirt of any kind whatever on the vacant lots corner of Washington street and Front street continued, next to the river, under penalty of being prosecuted according to law. John McEncror, Jr.
Mr. McEncror may have merely been trying to better-describe the location of an unnamed lane that had no helpful street sign, when he refers to “Front street continued”. Therefore, I do not know whether Judge Yates’ “Front St. continued” claim had any basis beyond his wishful thinking, or was perhaps the purposeful attempt of a few property owners on the block to change the name by coining and repeating a new designation of their own invention in the hope that it would eventually catch on and take root. ** Ed. Note: As with any other point made or missing in this piece, I hope that any reader who can enlighten us further on the topic will do so, in a Comment to this posting, or by reaching me directly. I will gladly make appropriate corrections or additions. “At one time he had a house lot in the village probably on the west corner of Washington street and Cucumber Alley, having a front on the former street of about 166 feet and extending back to the Binnè kil. The alley on the north side — 16 feet wide wood measure, — was the passage to the Binnè kil which was crossed by a scow to his farm on the Great island”. [see A History of the Schenectady Patent in the Dutch and English Times, at 189, by Jonathan Pearson, A. M. and others, edited by J. W. MacMurray (J. Munsell’s Sons, Printers, 1883)].
. . . The lane referred to in the 1799 law is, of course, the thoroughfare that has popularly been known as Cucumber Alley. See Schenectady Gazette, “Famous Spots in Local History”, No. XXII, The Naming of Streets, pt. 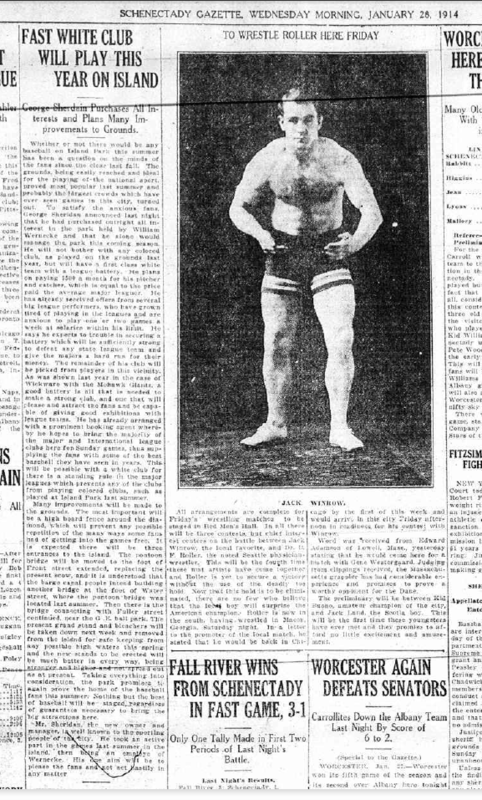 2, (April 1, 1909), which is excerpted in the collage at the head of this paragraph (all rights reserved by the Gazette*). Very few people that I’ve encountered are aware of the Front Lane designation, and I had never heard of it before this research project. Other than the 1909 Gazette and 1948 Evening Sun articles, I’ve found “Front Lane” referred to in only a few documents. 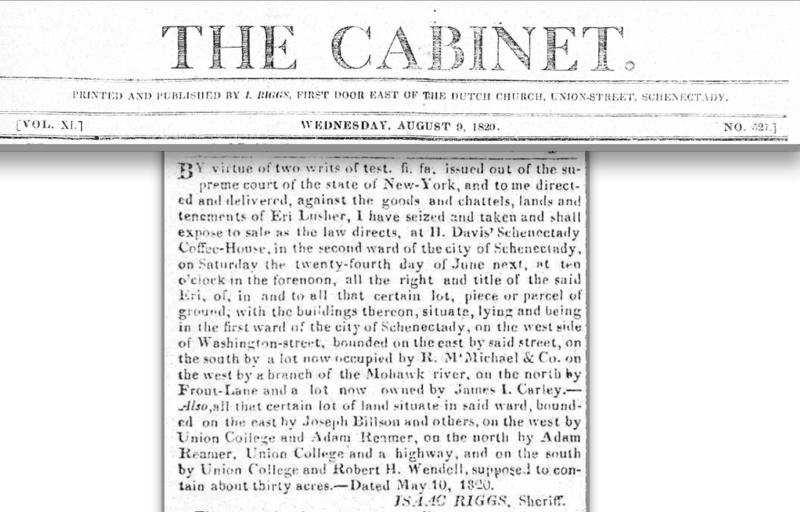 Thus, a legal notice in the Sheriff of Schenectady’s publication Cabinet (August 9, 1820) describes the seizure and upcoming sale of a parcel owned by Eri Lusher on Washington Avenue, bounded “on the north by Front Lane.” In addition, Pearson’s Street Books contain an 1827 deed using the description Front Lane, and also has a 1865 sketch map of the property that is now called 18 – 22 Washington Ave. showing its north boundary as Front Lane. 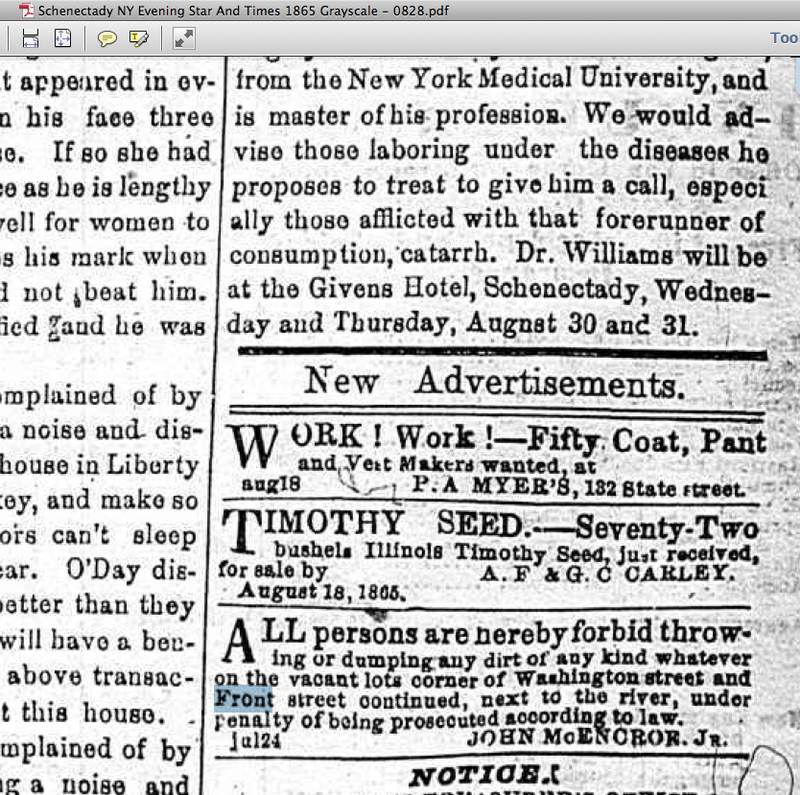 Despite the alley’s official designation as Front Lane, however, a 1839 classified ad in the Gazette for the sale of the former Van Slyck tavern property is quite detailed in its description of the location, but refers to the property being “about 40 feet front on Washington street, about 300 feet in depth along Cucumber Alley” — with no mention of Front Lane. It seems, therefore, that the Council’s command that the lane “shall hereafter be known and distinguished by the name of Front Lane” has long been ignored or forgotten, which might be why no one bothered to repair or void the road’s official designation as Front Lane. Sanborn Insurance Maps, 1889, 1900, 1914-1929 . Although maps as early as the 1698 Romer map (which hangs on the wall of the library of the Schenectady County Historical Society) indicated a short, narrow road or lane at the location of Cucumber Alley, the lane is not identified with a name on any 18th or 19th Century city atlases or insurance maps that I have been able to locate. 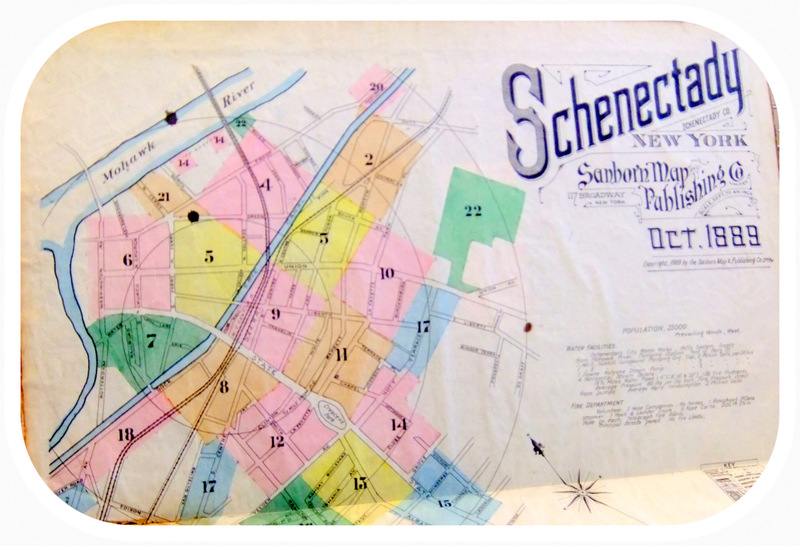 The very first published compilation of maps of the City of Schenectady that shows any name for the lane we call Cucumber Alley was apparently the 1900 Sanborn Insurance Map, which called it “W. Front St.” I could find no event that explains the decision by Sanborn’s mapmakers to give the alley a name, much less that particular name. 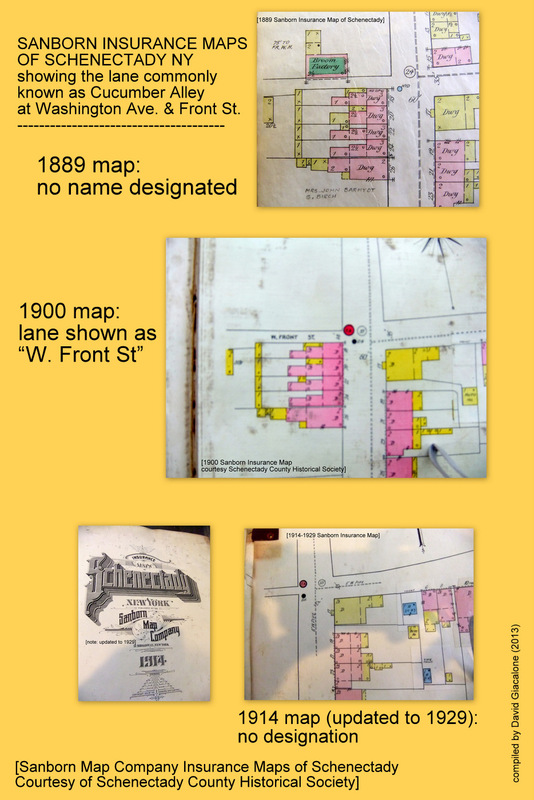 As seen in the above collage of Sanborn maps, the 1889 Sanborn Map has no name given for the lane. 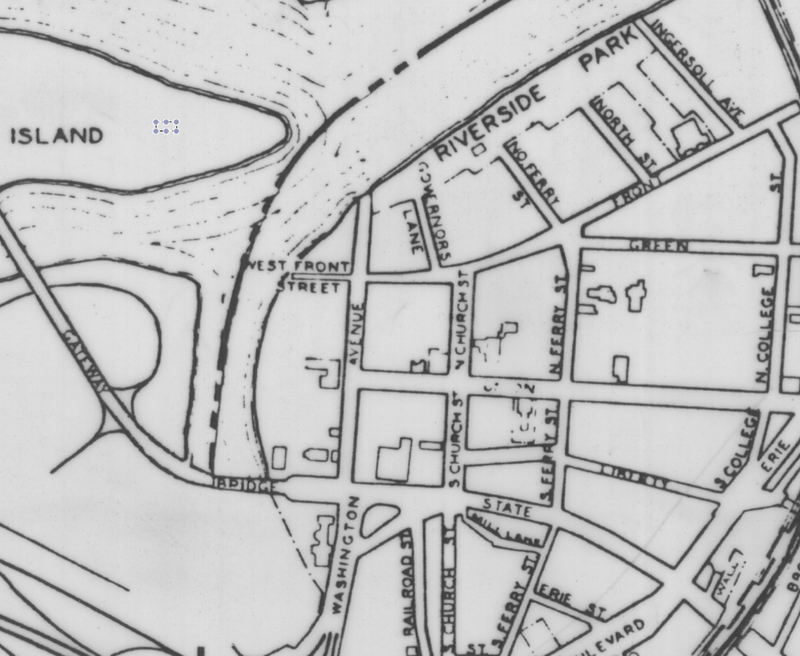 And, while the 1900 Map calls it W. Front St., the subsequent 1914 Map, which was updated through 1929, again leaves the lane unnamed. 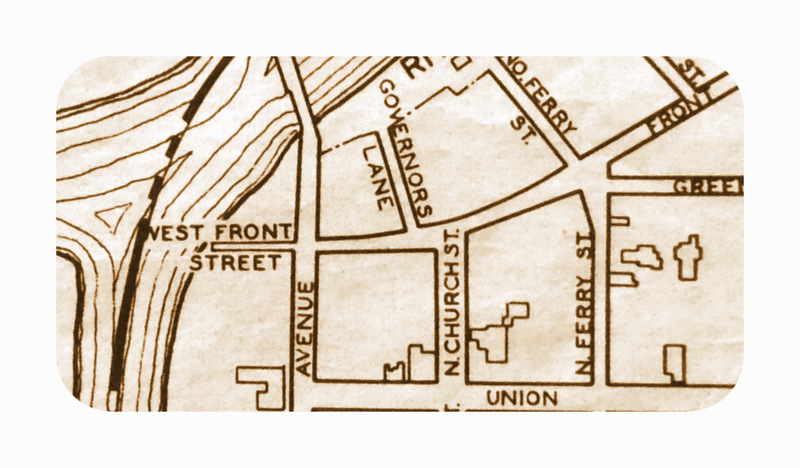 The 1914-1929 version appears to be the last Sanborn Map published before the Common Council acted in 1933 to impose the name West Front Street. 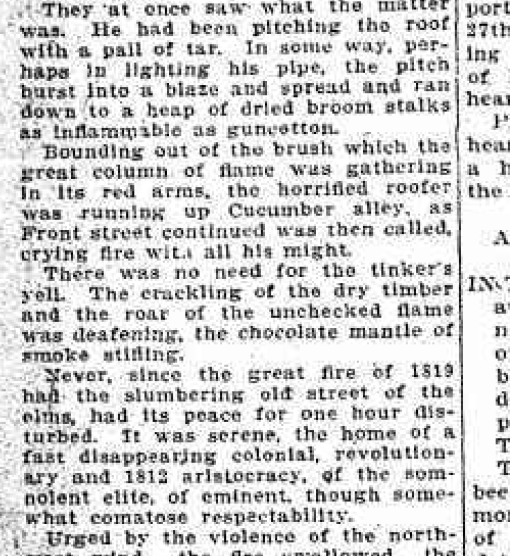 Similarly suggestive of the informal status of the name, an April 17, 1917 Gazette article put quotation marks around the words “Cucumber Alley”, when reporting on remarks given at a Troy dinner by Schenectady’s Fire Chief, when he described the great 1861 fire, which he noted had started at a broom factory located on Cucumber Alley. 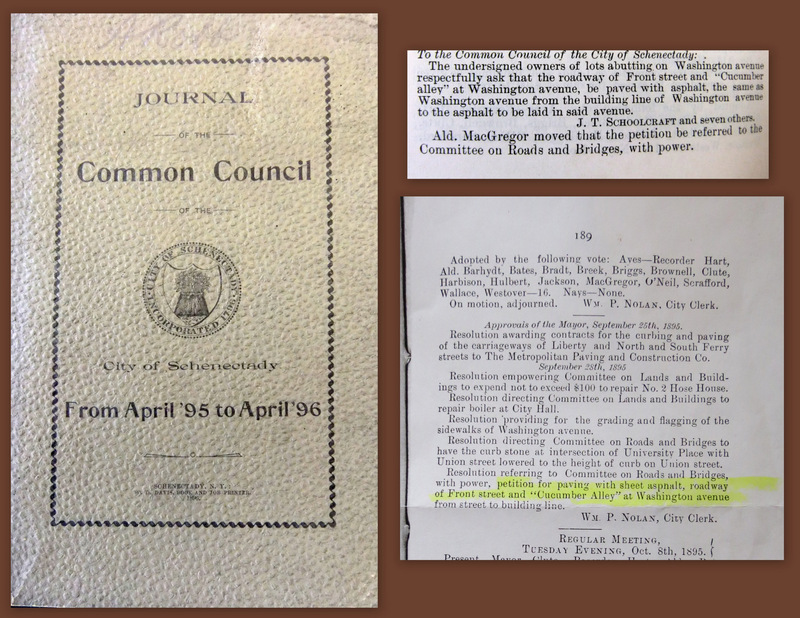 A 1910 Bureau of Engineering report in the Proceedings of the Common Council (see image on the right) gives an inventory of paved roadways in Schenectady. It appears to be the first time a City department uses that name in an official report. The Report lists Cucumber Alley without quotation marks, noting that the paved alley is 15.7 feet wide at Washington Ave. and 19.2 feet at the river. There is no mention of or reference to any of the other names sometimes attributed to the alley (West Front Street, Front Lane, or Front Street continued/extended). 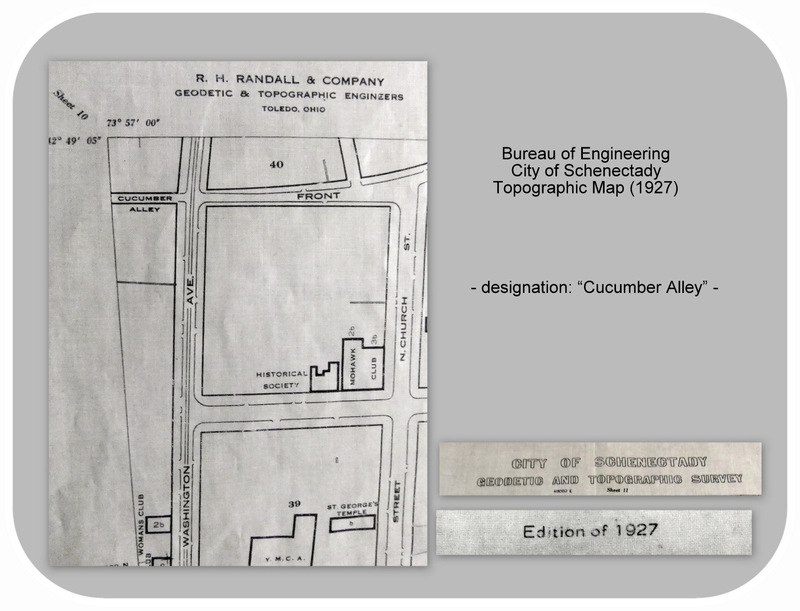 The Cucumber Alley designation also appeared on the Bureau of Engineering’s 1927 map of the City, apparently the first City map to use the term (click on image at head of this point).
. . . And, despite Ordinance 7460 “changing” the name to West Front Street in 1933, the Ward 1 map made by the Engineering Dept. in 1942 continued to show “Cucumber Alley”. 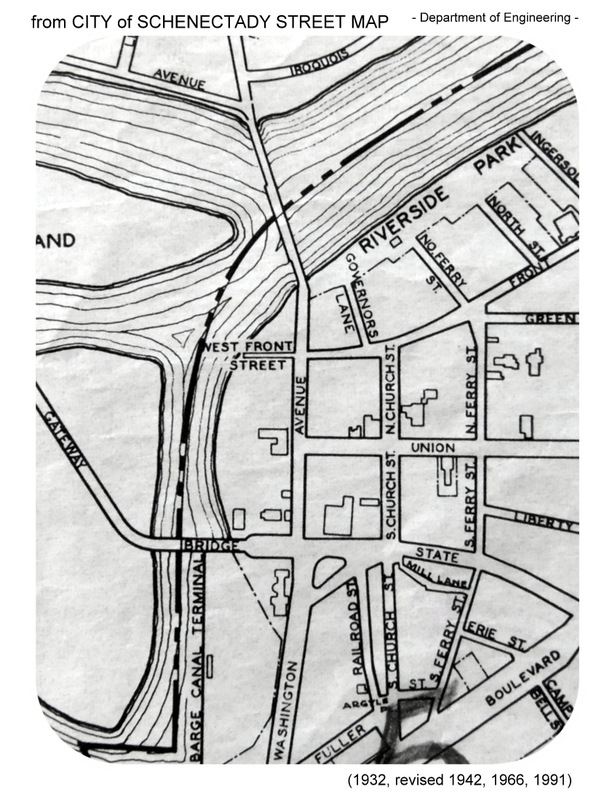 Ironically, however, the Engineering Department’s currently used and displayed City Street Map, which was last revised in 1991, still calls the lane “West Front Street” (map detail), even though Ordinance 77-41 officially restored the name Cucumber Alley in 1977. 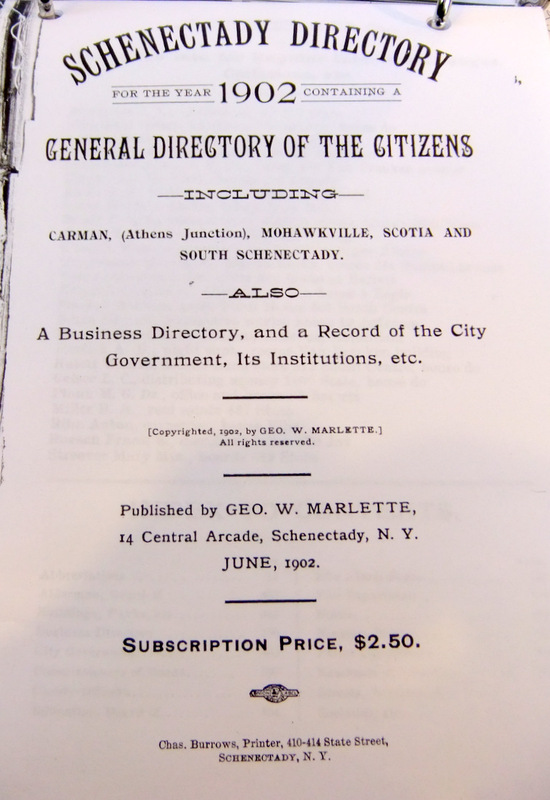 Marlette’s Directories for 1896, 1900, 1902 and 1904 do not include any listing for the ancient thoroughfare (not Cucumber Alley, nor West Front Street, or any similar name), despite the fact that such nearby minor roads as Cottage Row and Governor Lane are listed.
. . . 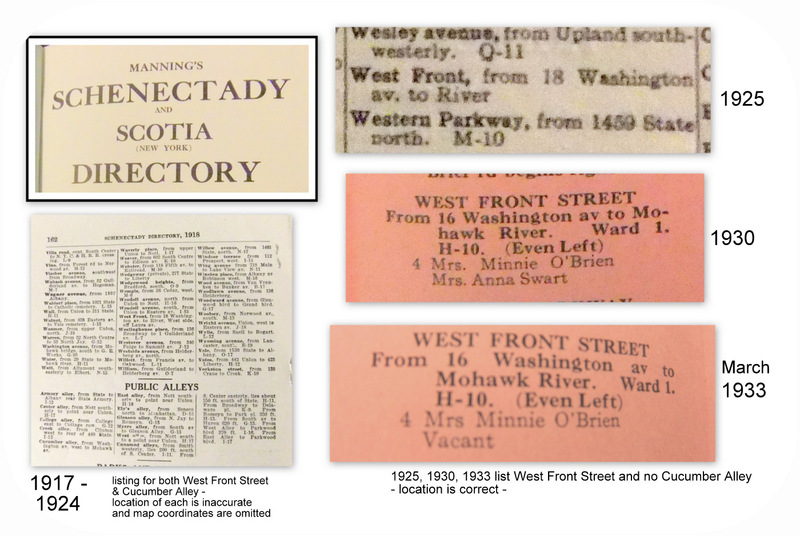 The Manning Directories for 1914 and 1915 list West Front Street, with no mention of Cucumber Alley, but incorrectly describe its location as being “from 18 Washington av. to River, west side, off Laura av.” (emphasis added) There was no Laura Avenue in the vicinity of Cucumber Alley in 1914 or any other year. The same street directory lists Laura Avenue as being “o.c. [outside city], from Guilderland av. 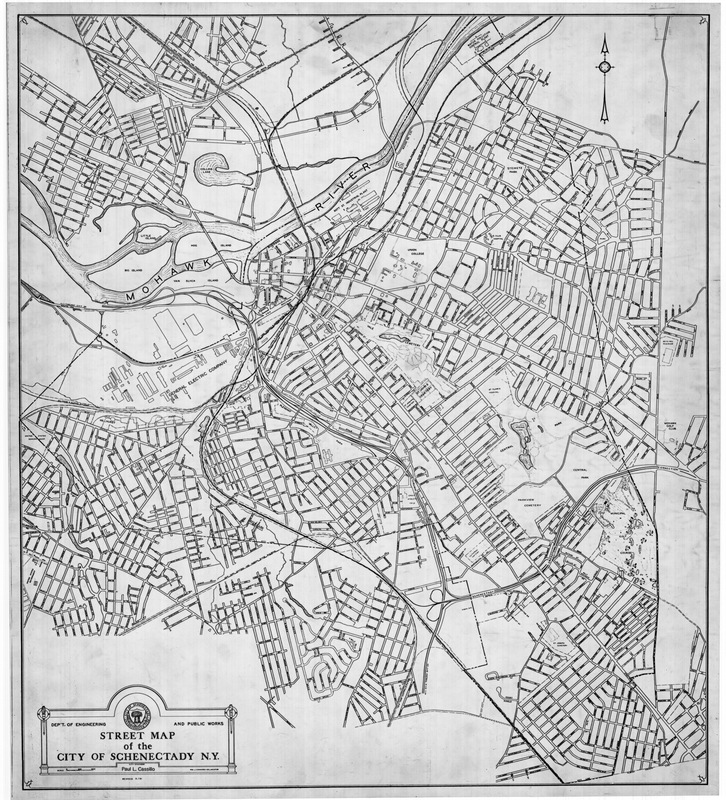 east.” In addition, West Front Street is apparently the only street in the entire Directory whose listing does not include a set of letter and number map coordinates [e.g., the list shows Wendall Avenue’s location on the publication’s city map as “I-15”]. 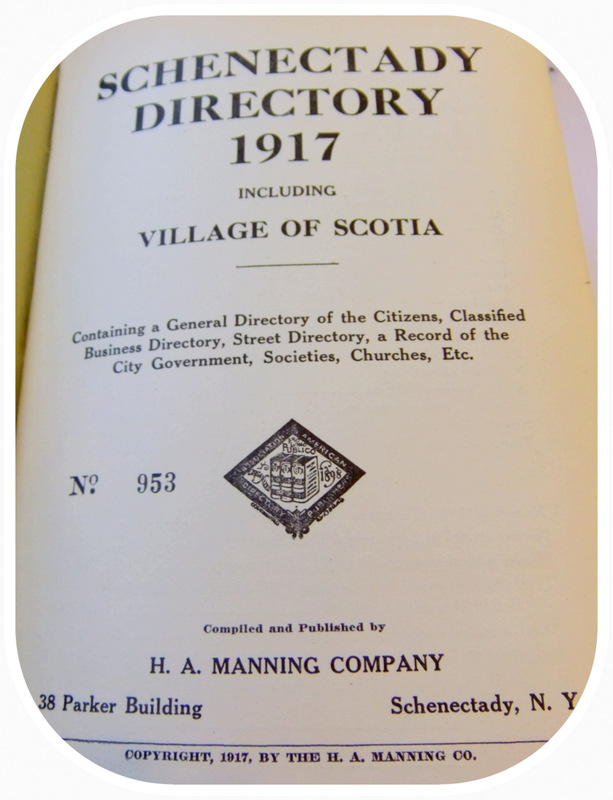 There does not seem to have been a Manning Directory published for Schenectady in 1916. 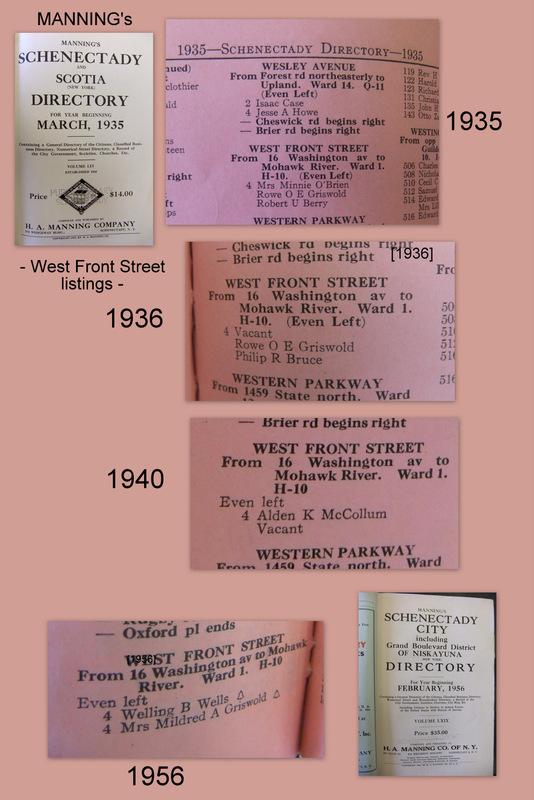 It was a surprise to discover, therefore, that the 1917 – 1924 editions of the Manning Directories list both West Front Street and Cucumber Alley (see above image from 1917), without any cross-references or map location coordinates, and with the location described differently and inaccurately in each listing. West Front Street has the same erroneous mention of Laura Av. in its description as did Manning’s 1914 and 1915 editions (discussed in the point above). 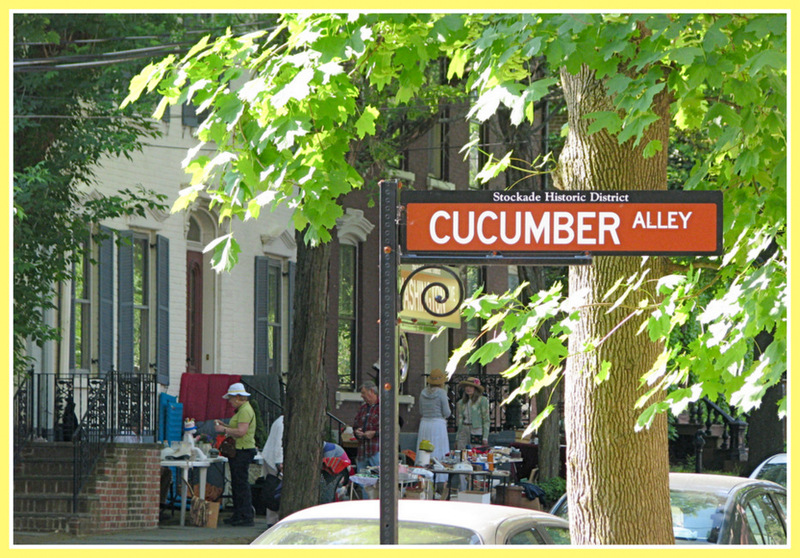 Cucumber Alley is, on the other hand, said to run “from Washington av. 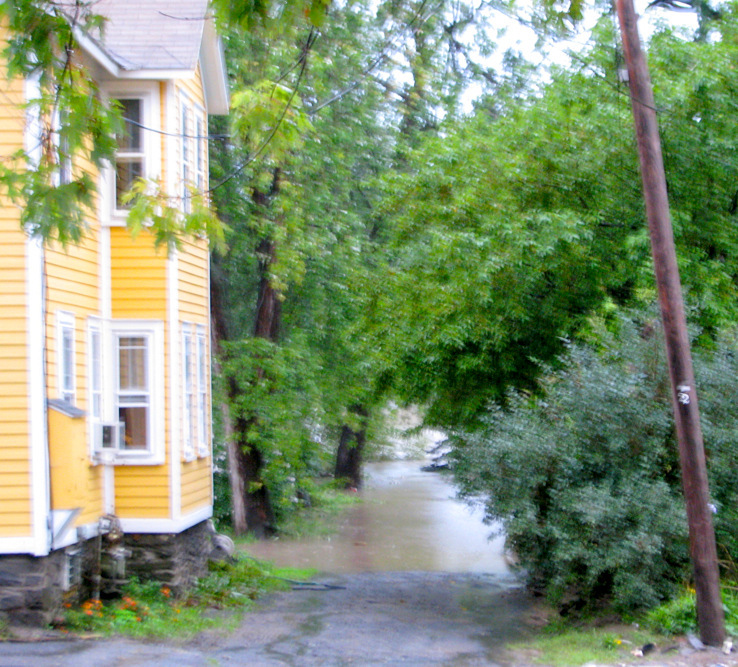 west to Mohawk av.” Cucumber Alley, of course, terminates at the Mohawk River, not Mohawk Avenue. 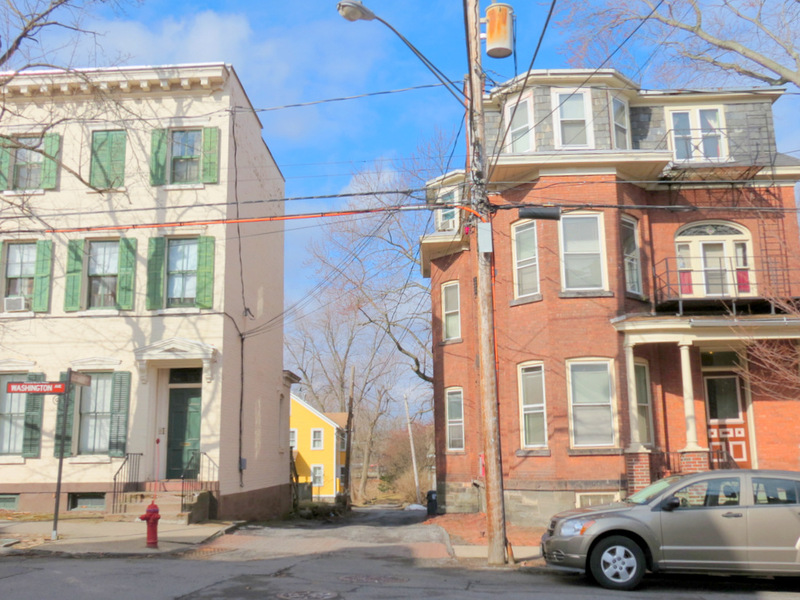 Schenectady’s Mohawk Avenue is considerably east of Cucumber Alley, at the far end of Front St. Scotia’s Mohawk Av. is northeast of Cucumber Alley, on the other side of the River. 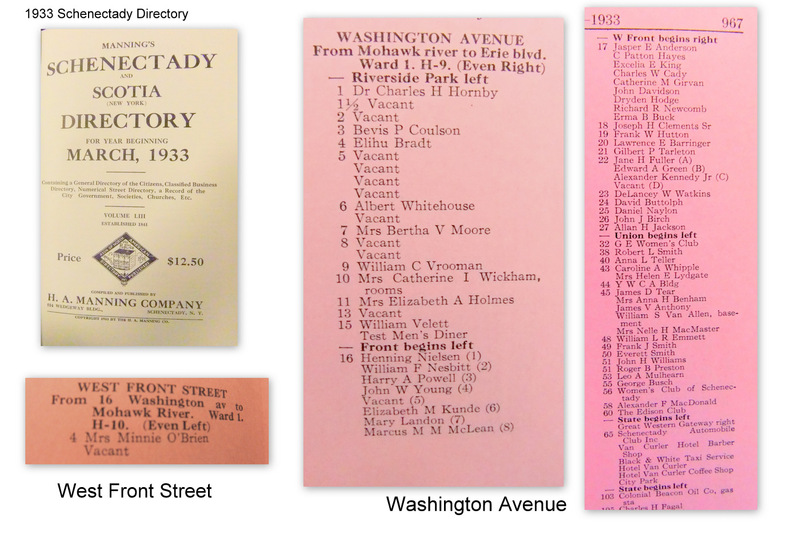 The 1925-1933 editions of the Manning Directory list only West Front Street. [see collage of excerpts] The 1925 and 1926 editions correctly locate the alley “from 18 Washington av. to River”. (emphasis added) However, they again fail to include map coordinates. By the 1930 and 1933 editions, however, West Front Street is instead said to run from “16 Washington av to Mohawk River” rather than 18. The alley is in fact located between 16 and 18 Washington Avenue, with 16 being on its north side and 18 on its south side. Happily, as the collage at the head of this point shows, by 1930, Manning finally gives the alley a pair of map coordinates: H-10. 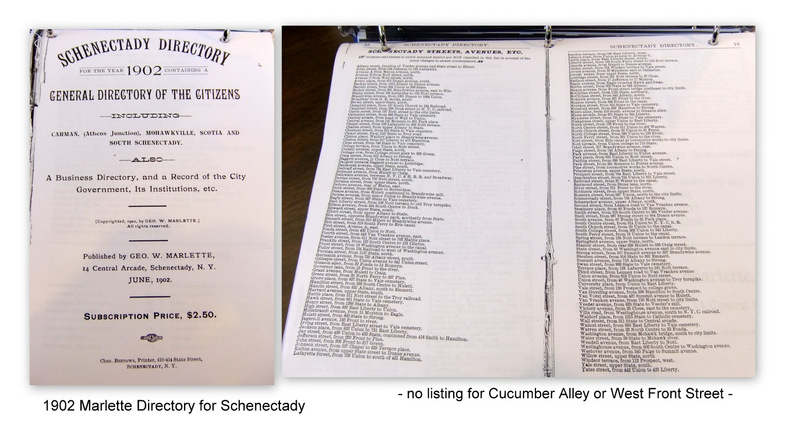 At no time did the Marlette or Manning directories give a listing solely for Cucumber Alley. 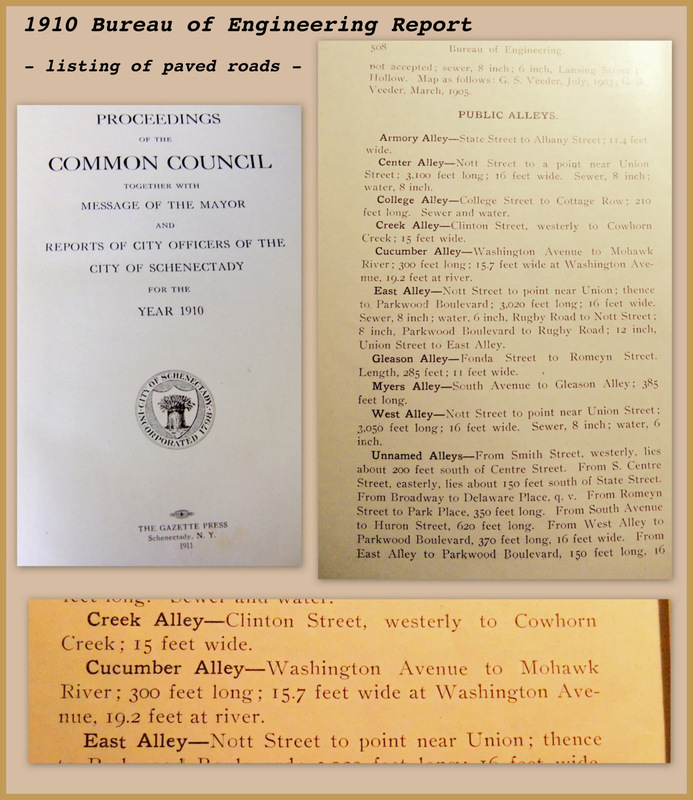 The inclusion of Cucumber Alley by Manning from 1917 to 1924 may have been related to the City Engineering Bureau’s decision to label the roadway Cucumber Alley in its listing of paved roads. Although Manning clearly needed to choose between the two names when indicating the road, or else to somehow cross-reference the listings, I have neither found nor discerned the reason for the publisher’s decision to drop the name Cucumber Alley and refer solely to West Front Street. Front Street Extended (1933): Just as I was unable to confirm that Judge Yates’ “Front Street continued” was ever an extensively-used, much less official, designation for the lane in question, I have found no basis for it ever officially being called “Front Street Extended”. Searching at the FultonHistory.com website, I located three mentions of “Front street extended” in the Schenectady Gazette. 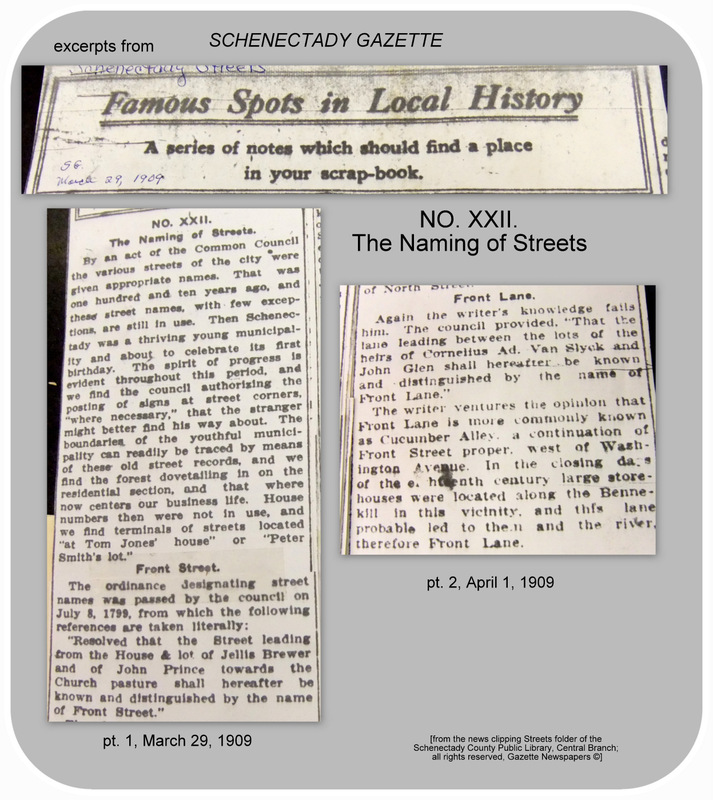 However, two articles mentioning “Front street extended” in 1919 are referring not to Cucumber Alley, but to a short stretch of road on the “easterly end of Front street and the northerly end of Peek street” (click for example). The third article, from 1914, gives an intriguing look at professional baseball (and race relations) at Island Park on the now-submerged Van Slyck Island (“Fast White Club Will Play This Year on Island,” Jan. 28, 1944). It notes that there were three entrances to the island, and that “The pontoon bridge will be moved to the foot of Front street extended, replacing the present scow.” A scow did run from the end of Cucumber Alley to Van Slyck Island, and the reference to “Front street extended” most probably does mean Cucumber Alley. Nonetheless, I have found no official City document or map, and no directories of the City, that use the term “Front street extended” to refer to Cucumber Alley. 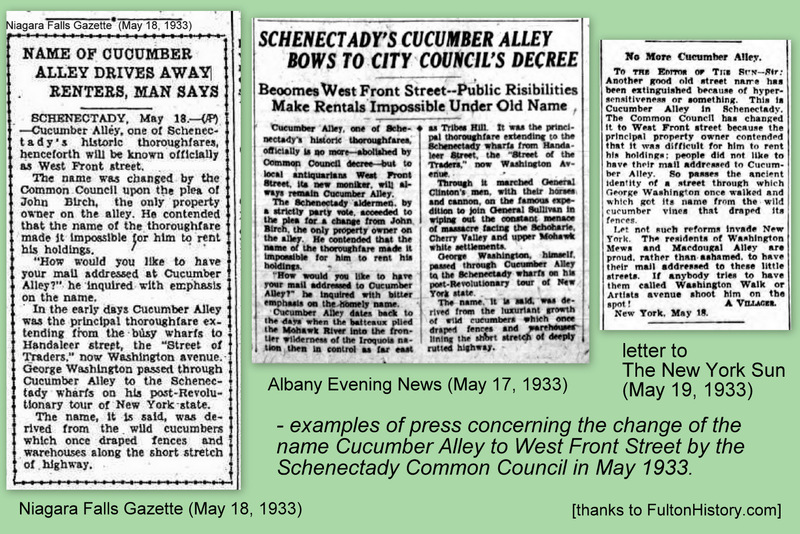 Given the merely unofficial status of the name Cucumber Alley, despite its longstanding adoption and usage by the citizens of Schenectady, it is inexplicable that the Common Council was willing to be stampeded in 1933 into banishing the name for the flimsiest of reasons, ignoring a public outcry against the change. Here is the tale of the petition for change and the silent submission by the majority party on the Council. West Front Street. 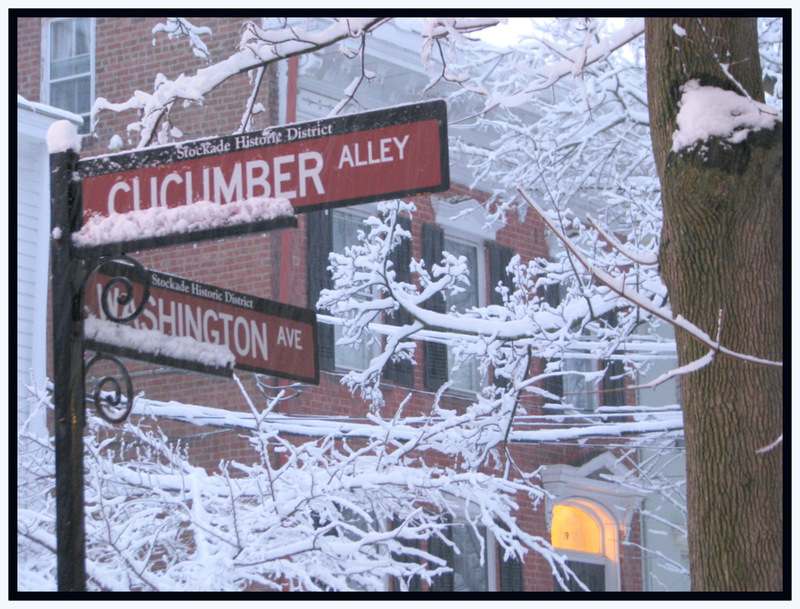 Although it lacked official designation, the name Cucumber Alley apparently appeared on a street sign at the entry to the lane in the early 1930s, and it was used as the street address for the sole building on the lane. Despite its long history, the ancient name made a negative impression on at least one group of Stockade residents. 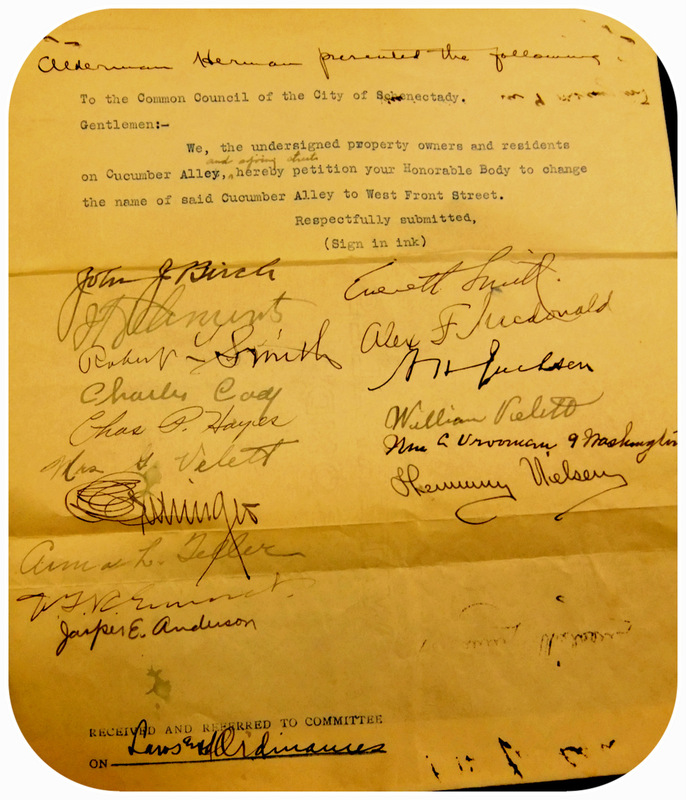 Thus, in May 1933, sixteen upright/uptight Stockade neighbors petitioned the Common Council to officially “change” the name of the thoroughfare to “West Front Street” . 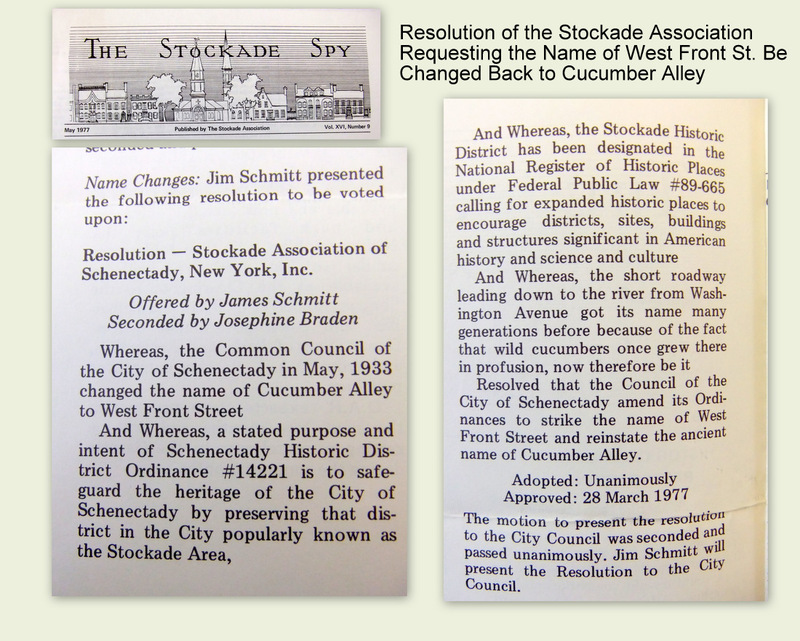 The text of the Petition gave no reason for the proposal which was instigated by the influential John J. Birch, who was at the time the only property owner on Cucumber Alley (the two-unit building at 4 Cucumber Alley), and who was later to become President of the Schenectady County Historical Society. the Birch petition . . .
To the Common Council of the City of Schenectady. We, the undersigned property owners and residents of Cucumber Alley, and adjoining streets, hereby petition your Honorable Body to change the name of said Cucumber Alley to West Front Street. Residents of the first ward and of other parts of the city who are opposed to changing the colorful name of Cucumber alley, even for something perhaps a bit more dignified, will find a champion for their cause in the Democratic minority leader of the common council, Anthony Rinaldi. . . . He declared that his principal motive for asking the change was due to the difficulty of renting his property. The present tenants –the third in two generations–have threatened to move out, he said, unless the name of the street is changed or the obnoxious street sign removed. When he tried to show the house to possible tenants, Mr. Birch said, they turned away immediately when they learned the name of the street. The street was once named West Front street, Mr. Birch said. 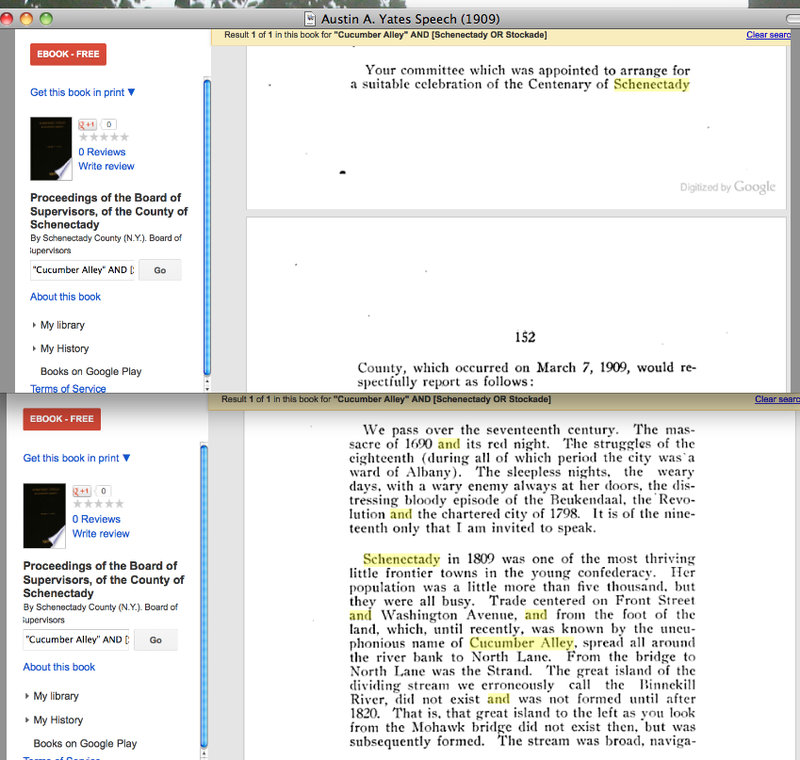 Rinaldi charged that Alderman William Herman, father of the measure, was sponsoring the change to make up for his lack of advancing progressive legislation in the past.
. . . .principal documents in the record of Ordinance 7460: Petition, Committee Report, Resolution, Summary of Public Meeting, Record of Vote. 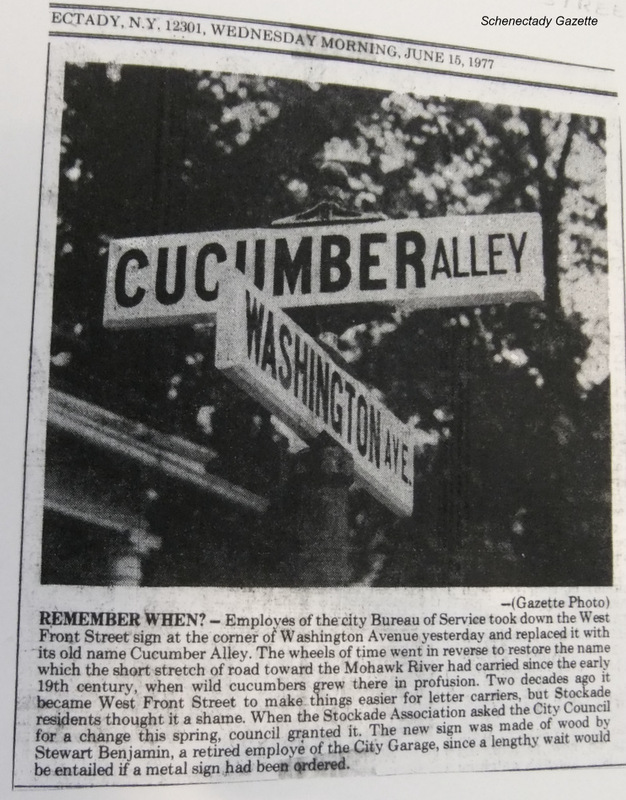 According to the record of the Vote that night, “In voting against the resolution Alderman Rinaldi said he believed there was a great deal of sentiment among old residents of the city to keep the name Cucumber Alley.” (And see “Posts Defense for Cucumber Alley Name,” above.) 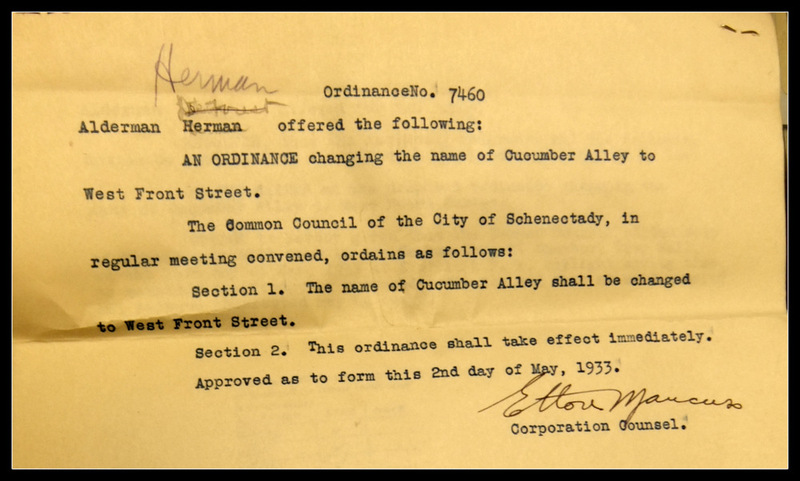 Nevertheless, with a 9-5 party-line vote, Ordinance 7460 — “An Ordinance changing the name of Cucumber Alley to West Front Street” — was passed on May 16, 1933. There clearly was no valid or sufficient public-policy reason given or suggested for abandoning the name of Cucumber Alley and changing it to West Front Street, even if short-term landlord hardship could somehow be deemed a justification for abandoning history and tradition. It is questionable that Mr. Birch’s claim had any factual validity. According to the Manning Directory for 1930, #4 Cucumber Alley had tenants for each of its two units that year; and one of those tenants (Minnie O’Brien) was still there in March 1933, just prior to Birch’s Petition, when the 1933 Manning Directory was published. 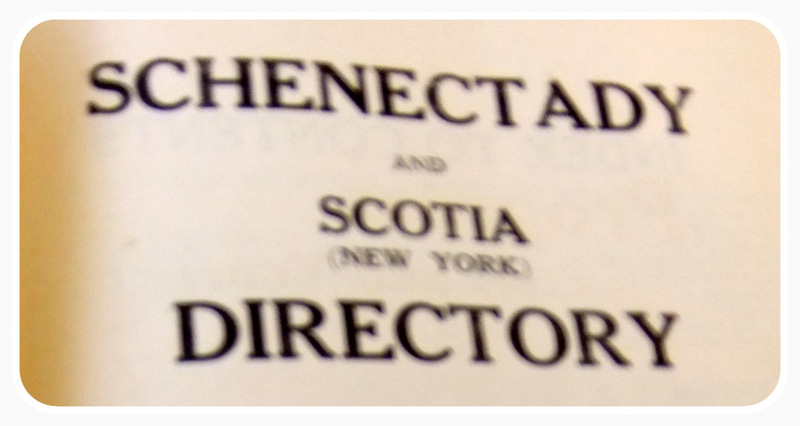 (See Manning’s Schenectady and Scotia Directory 1930, and 1933, respectively; Manning began listing each residence and its occupants in its street directory in 1930, rather than merely listing street names and location.) Birch’s claim seems preposterous that tenants who had already moved into his property knowing it was on Cucumber Alley and having seen the street sign on the corner threatened to move out if the name wasn’t changed. Moreover, the Manning 1933 Directory lists 11 vacant housing units on the abutting block of Washington Avenue (from 1 to 16 Washington Ave.), making the single vacancy on Cucumber Alley far from unique. (See the image at the head of this paragraph for relevant portions of the 1933 Directory.) It was, after all, the Great Depression. And, by the way, the Washington Avenue vacancies apparently did not bring about a similar campaign to change that street’s name to something more genteel and landlord-friendly. 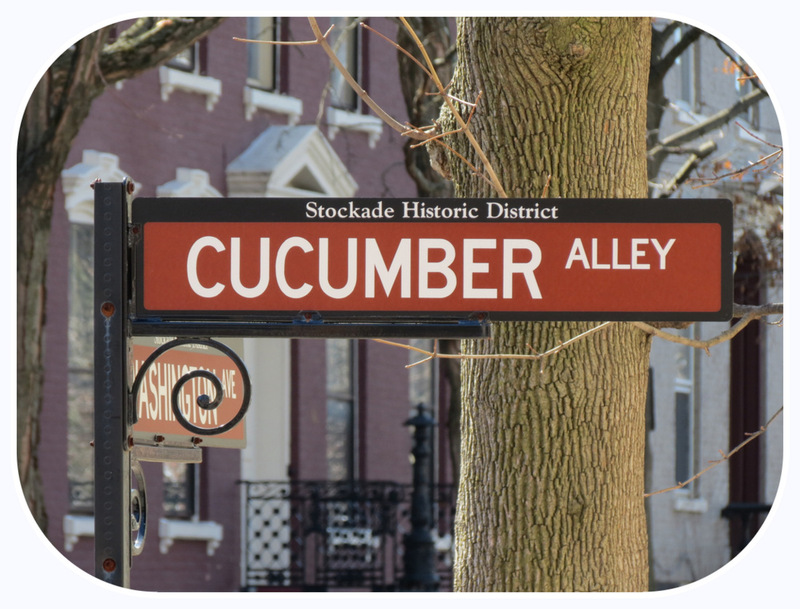 Fluctuations in the overall economy, the rental market for Stockade residences, or the Birch family’s efforts searching for or pleasing tenants surely are the main forces in the vacancy rate on Cucumber Alley.
. . . 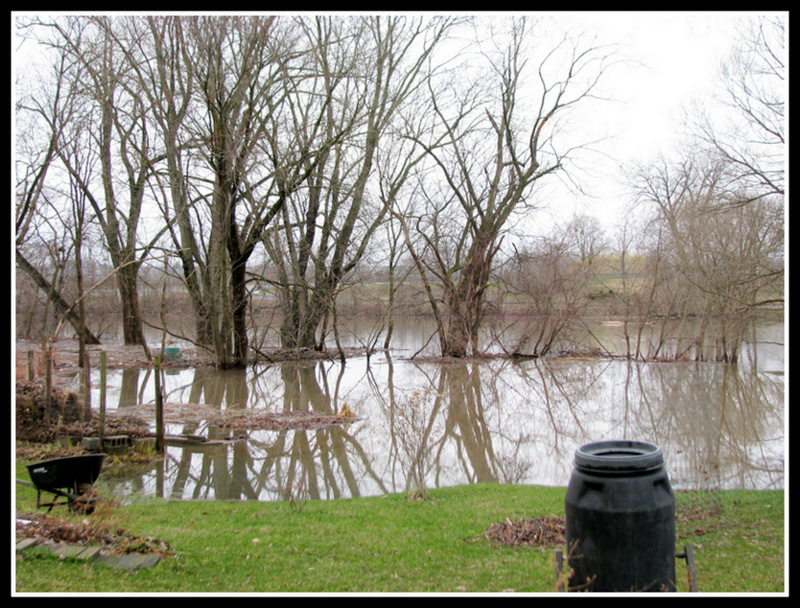 In addition, the backyard of 4 Cucumber Alley is often the very first property in the Stockade to flood when the Mohawk River rises, even when the rest of the neighborhood is unscathed. The property might very well have been difficult to rent for that reason in the 1930s. The only explanation for passage of Ordinance 7460 is one that is irksome in any century: a prominent citizen asks for special treatment and receives it, despite the abandonment of historic values, a lack of common sense, and citizen opposition to the proposal. It is especially incongruous that John J. Birch, a man who was later to be a major Stockade historian and president of the County Historical Society, would make such a request based solely on his pecuniary interests. Historian Birch also claimed that the lane had previously been named West Front Street, making the change sound like it had a historical basis, but I could find no proof that any department of the City, much less the Council, had ever called Cucumber Alley by that name prior to 1932, and I found no reference of any sort to West Front Street prior to the 1900 Sanborn Insurance Map. Dr. John J. Birch was a noted Schenectady historian and educator, who spent his entire life residing at 26 Washington Ave, next to a home that became the Schenectady County Historical Society, where he served two terms as president. His rental property at 4 Cucumber Alley abutted the rear of his residence. His maternal ancestors (the Barhydt family) were prominent in the once-thriving Schenectady corn broom manufacturing industry that was centered at Cucumber Alley. 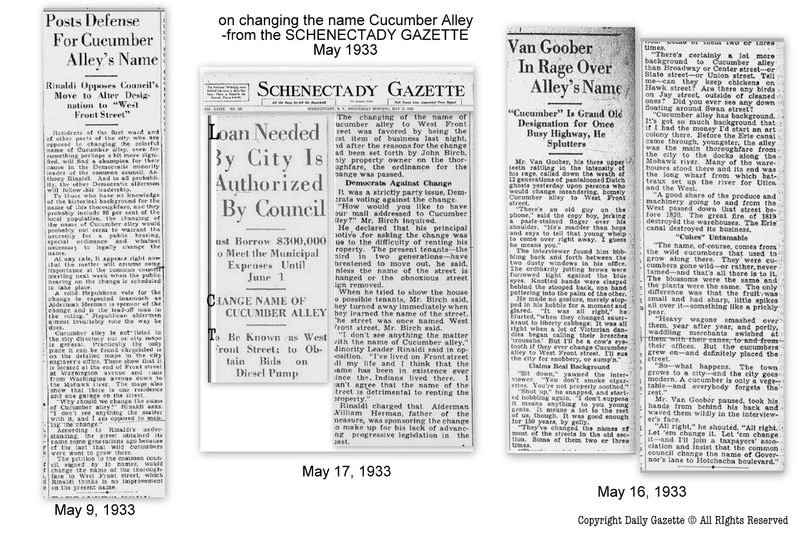 It was reassuring for me to learn that the local and statewide press did a lot of smirking over the Common Council’s doing away with the name Cucumber Alley. 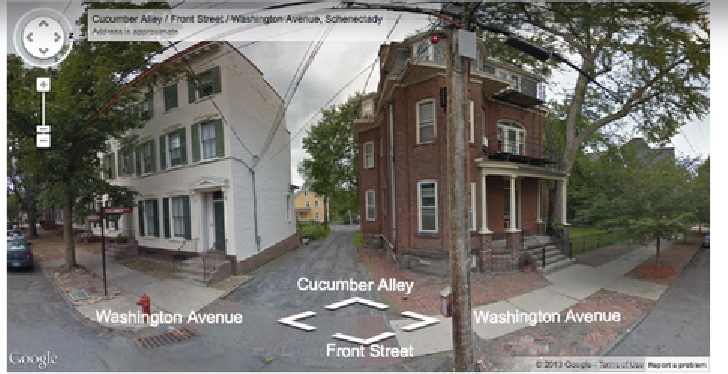 The loss of the name Cucumber Alley must have been a sore point for many Stockade residents and lovers of Schenectady’s history. 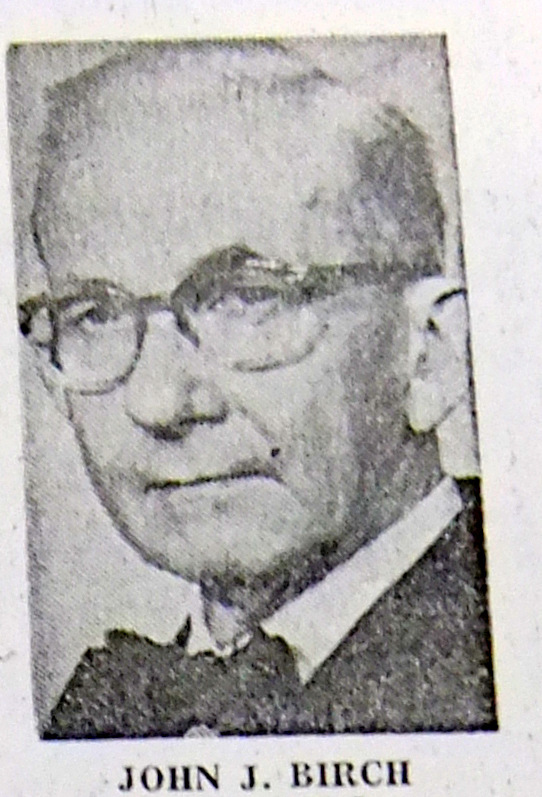 Everett Smith, a “leading citizen” and life-long Washington Avenue resident, who was former president of Schenectady Savings Bank, was asked about the name change in a 1936 Gazette interview celebrating his 79th birthday. 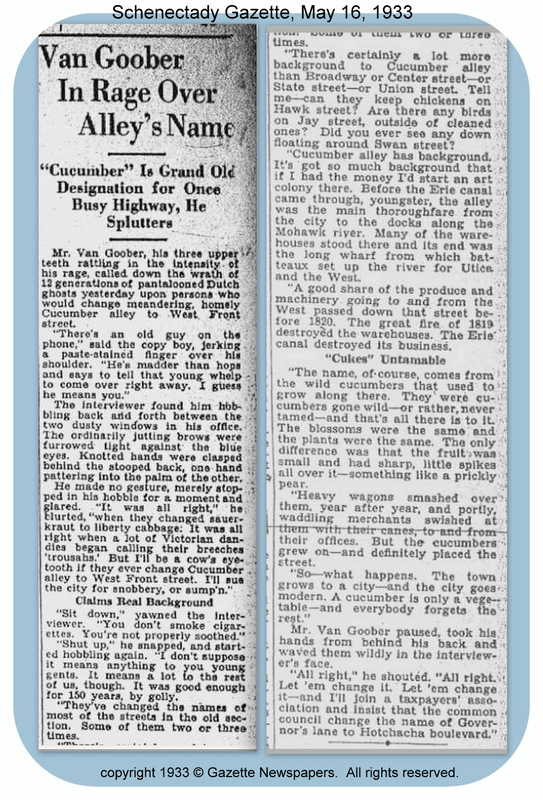 Smith’s reply was “Such a beautiful name, Cucumber Alley, don’t you think?” (Schenectady Gazette, “Everett Smith, Banker Fifty Years, Reminisces” (Jan. 19, 1936). That sentiment is surprising, as it came only 3 years after Smith had been among the 16 people signing Birch’s petition to change the name to West Front St. Perhaps Smith did not read the petition presented to him by John Birch before signing it. 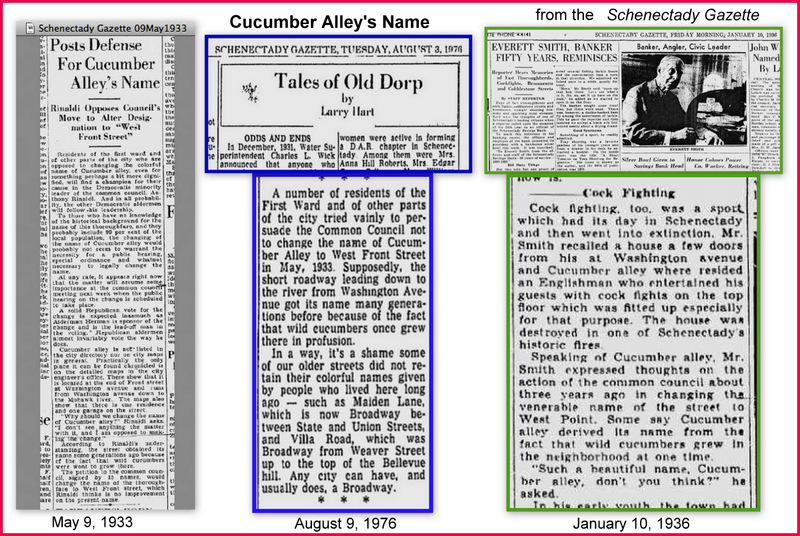 As the Albany Evening News predicted, Cucumber Alley was not a name that could be easily erased. 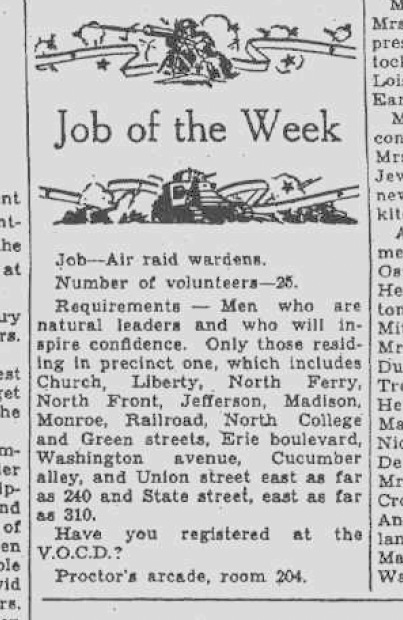 For example, despite the 1933 name-change, a 1942 wartime notice looking for volunteer air raid wardens for Schenectady’s precinct One, lists all of the streets included in the district, and uses the name “Cucumber alley” rather than West Front Street (Schenectady Gazette, “Job of the Week,” April 20, 1942). 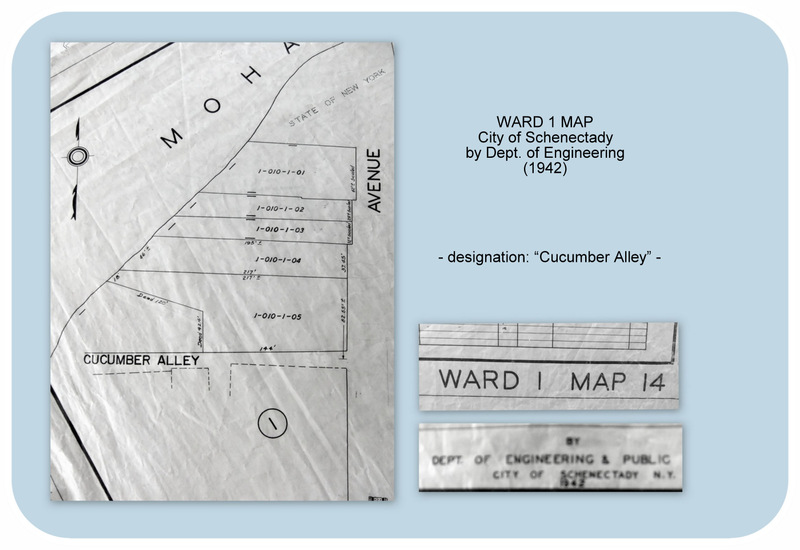 As shown above, a Ward Map made by the City Department of Engineering in 1942 also labelled the road Cucumber Alley. Resolution — Stockade Association of Schenectady, New York, Inc. 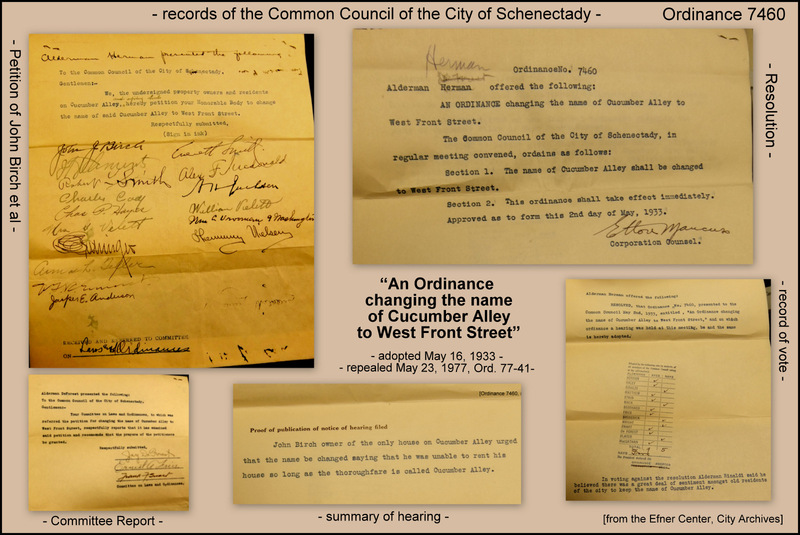 Resolved that the Council of the City of Schenectady amend its Ordinances to strike the name of West Front Street and reinstate the name of Cucumber Alley. 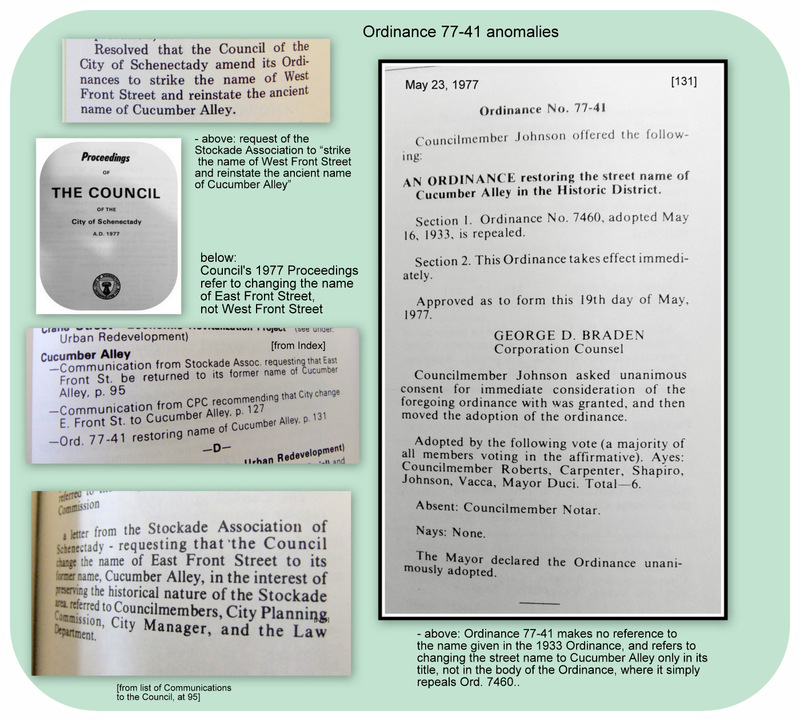 In addition, the Ordinance itself may have been drafted by someone unsure whether to refer to West or East Front Street: The actual name given to the lane in 1933 is not mentioned in Ordinance 77-41, which merely states that Ordinance 7460 is repealed. 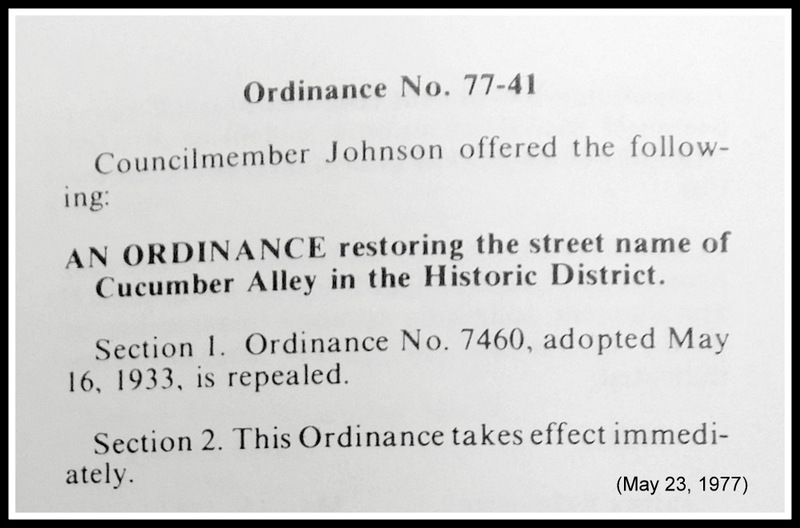 Furthermore, the restoration of the name to Cucumber Alley is mentioned only in the title of Ordinance 77-41, the body of which has only two sections: 1) repealing Ord. 7460, and 2) making the new ordinance immediately effective. Given the intent of its proponents, I have no problem as a lawyer asserting that the lane is now “officially” designated to be Cucumber Alley. On its face, however, Ordinance 77-41 simply repeals/strikes the name West Front Street, leaving the status of the name Cucumber Alley in the uncertain and unofficial limbo described at length above. 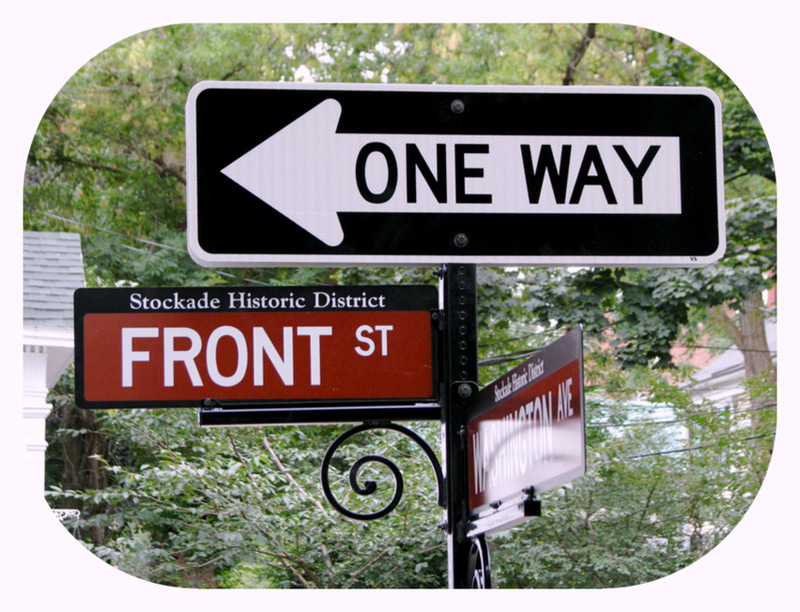 Perhaps, on the other hand, the savvy drafter of the Ordinance knew of the historical uncertainties and ironies, and wanted to preserve them as part of the Stockade and Cucumber Alley heritage. It had, of course, been 44 years since the West Front St. affront to the alley, which was brought about by prominent Stockade neighbors who should have been ashamed of themselves, and who gave little thought to the impact on mail carriers. 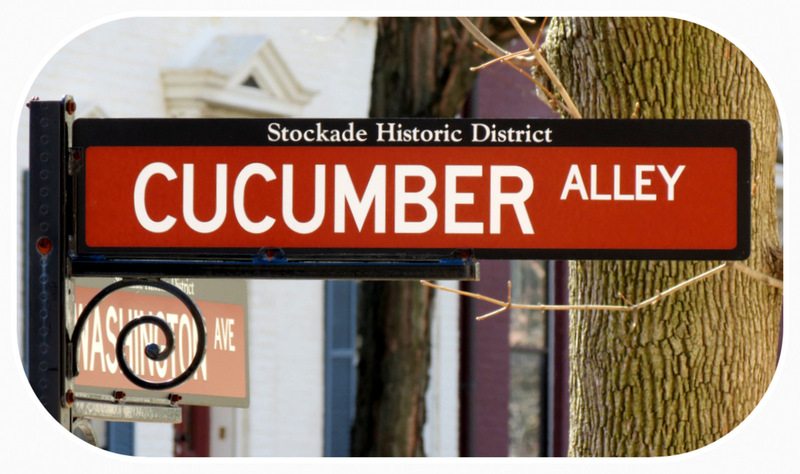 I am confident that Stockadians will never let the name Cucumber Alley die, nor allow the corner to be without a sign trumpeting its name, for the education and enjoyment of residents and visitors alike. Whether I’ll find wild cucumbers down by the River this spring is a bit more doubtful, but I plan to look often, and will post any wild cucumber photos to this webpiece when I have them. If you should spy wild cucumbers at the River end of Cucumber Alley, please let me know about your discovery before yanking them out for a souvenir or for weed control. .. reminder: see “celebrating Cucumber Alley” for more photos and info. Ongoing (Re)Search: Thanks to the hardy folks who read this essay through to its end. As I stated above, I hope readers with corrections or amplification on the points made in this essay, or with any interesting additional information about the history of the names given to Cucumber Alley will leave a comment or contact me directly. I will do follow-up inserts here as I receive or uncover relevant facts or anecdotes. 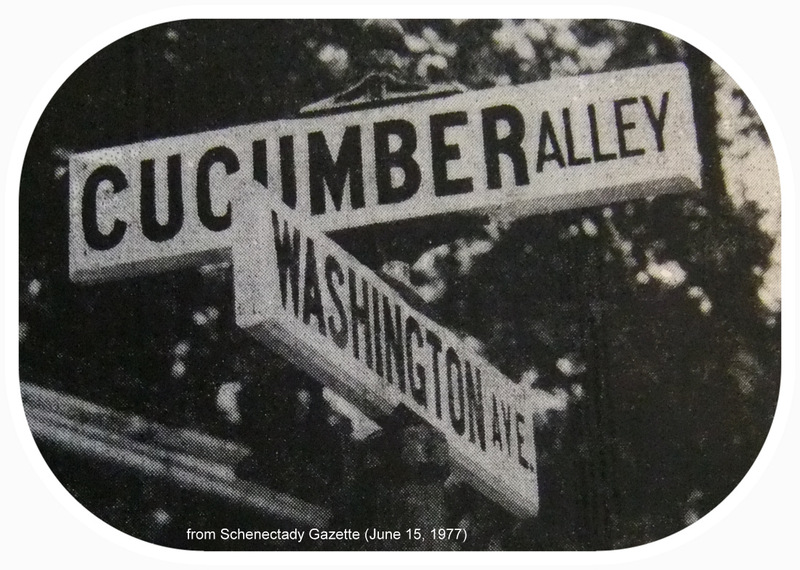 I would very much appreciate, for example, photographs of any Cucumber Alley signs that existed prior to the temporary wooden one shown above in the 1977 Gazette photo — such as the “obnoxious” one John Birch wanted removed in 1933. And, I am eager to see what the West Front Street sign looked like that the Gazette said was taken down on June 14, 1977. My searching at the Historical Society Library, the Central public library, and the City Archives has failed to uncover pictures of such signs. The old photo to the left is an example of my coming disappointingly close in that search. 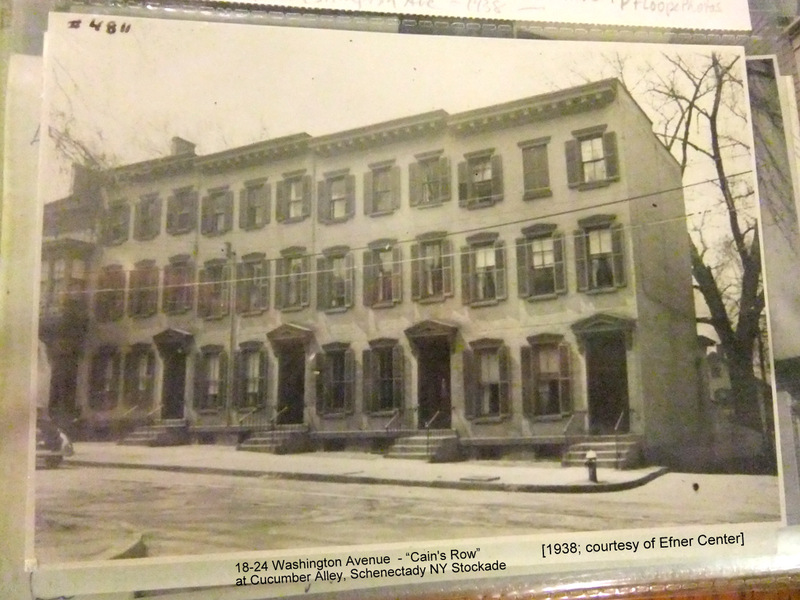 The photo, taken in the 1930s for the City’s Department of Public Instruction (and available at the Efner Center), is of Cain’s Row, the rowhouse apartments built shortly after the 1861 broom factory fire along 18 – 24 Washington Avenue, at Cucumber Alley. Whether the shot was taken at the wrong angle to capture a street sign on a post or wall, or there just wasn’t any sign yet at that corner, the vintage view of that intersection left me hoping someone will dig up an image of a “West Front Street” or “Cucumber Alley” sign for me from that era to complete the picture. Gratitude: Many thanks to all those who helped me with my research on the history of Cucumber Alley, and inspired me to exhaust the topic. Special thanks to Melissa Tacke, Librarian/Archivist at the Schenectady County Historical Society and Cynthia Seacord, (Acting) Archivist at Efner Center, the City of Schenectady’s Archives, who were both patient and helpful during my several visits; to Bob Sullivan, Reference Librarian at the Schenectady County Public Library, for his speedy replies; to Steve Caruso and the staff in the City’s Engineering Department, who helped me locate their old maps; to architect Werner Feibes, a founding father of the Stockade District and former owner and designer of 1 Cucumber Alley, for his reminisces; and to preservation architect and friend Rob Petito, tireless source of accurate information and helpful questions. Also, neighborly thanks to Cucumber Alley diva Sylvie Briber for motivation and baked goods. 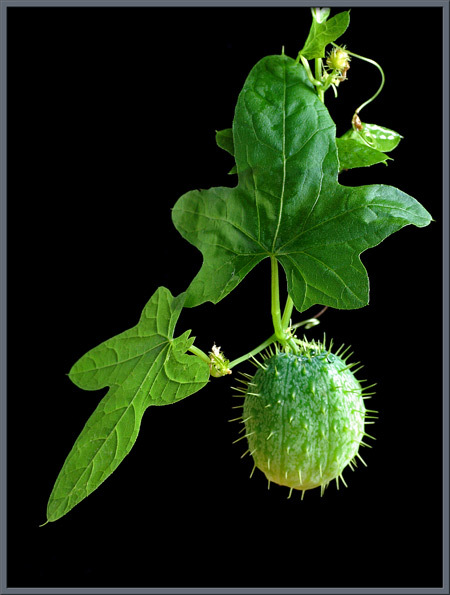 Brian Johnston allowed me to use his beautiful photos of wild cucumber plants from Miscscape Magazine to illustrate this essay, and his generosity and skill are much appreciated. Tom Tryniski of FultonHistory.com also deserves thanks for his amazing compilation of historical New York newspapers. 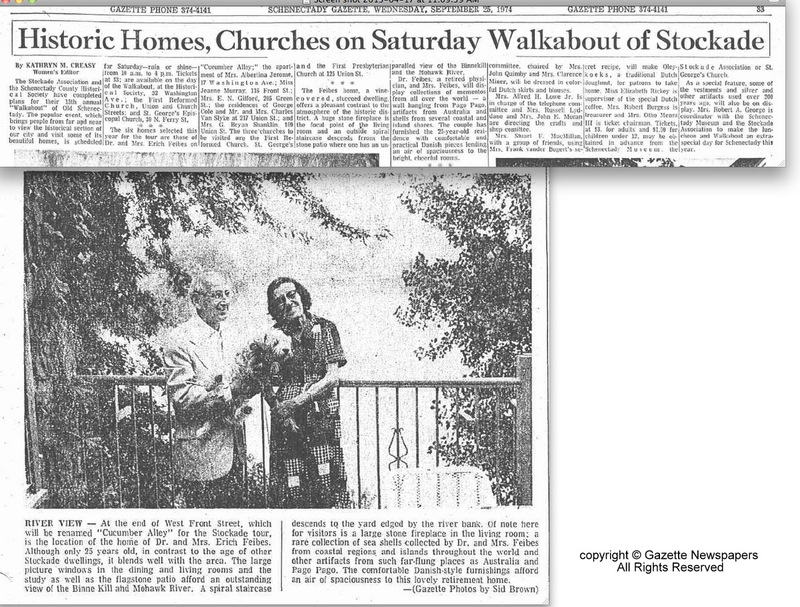 A major portion of all newspaper content that I found for this piece came from the comprehensive and (rather addictive) FultonHistory.com website. */ Special thanks goes to the Schenectady Daily Gazette, which was not only a most useful source on Schenectady history and the zeitgeist of various eras, but which has generously granted me permission to use excerpts and articles, and create related collages, as part of this posting. Although my own photos and text on this website may be used under a Creative Commons Attribution-Noncommercial-Share Alike license, the Gazette retains all rights in its materials, which are not to be further used or copied in any manner inconsistent with the copyright laws. Well, I must say I really enjoyed your post about the History of Cucumber Alley. Although I was very young when I knew my Grandfather Dr. John J. Birch Sr., I really never knew him. And after seeing the street sign for Cucumber Alley, I really wanted to know how it got that name, and thanks to your post I now know, and I must say that I am glad that it still remains that same. I think it has a catchy name and it’s history deems appropriate. Thank you, Claudia. The story got long and complicated, but I think it has a lot of lessons and a happy ending. Good luck with your project learning and writing about your grandfather.